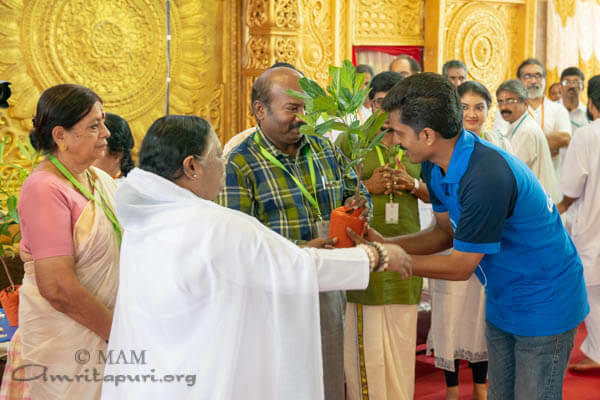 During the public function, Amma gave away saplings to AYUDH members members, promoting the ‘Nalpamaram Natinnu Nalvaram’ നാല്പാമരം നാടിന്നു നൽവരം project to plant medicinal trees in temples and ‘Kavu’ (sacred groves). 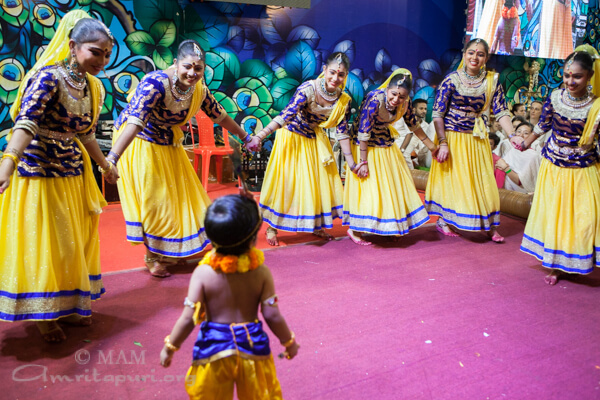 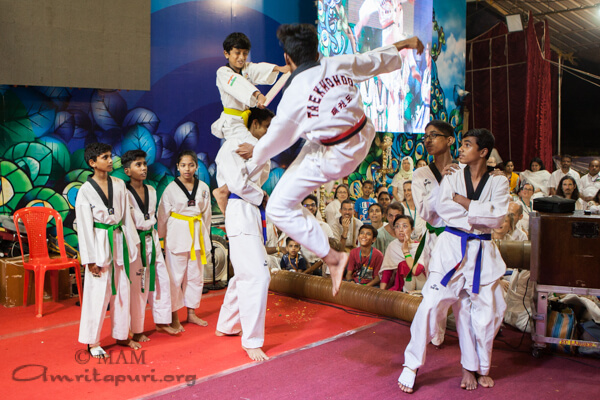 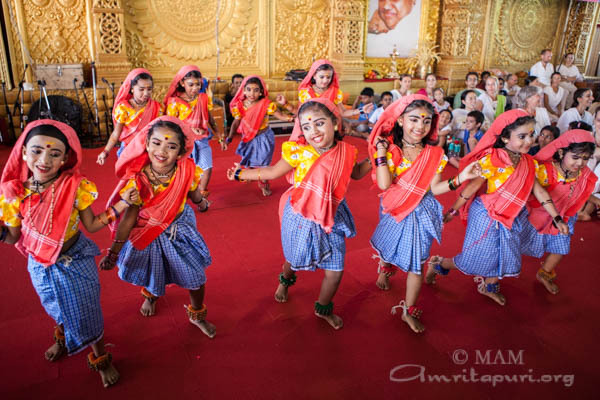 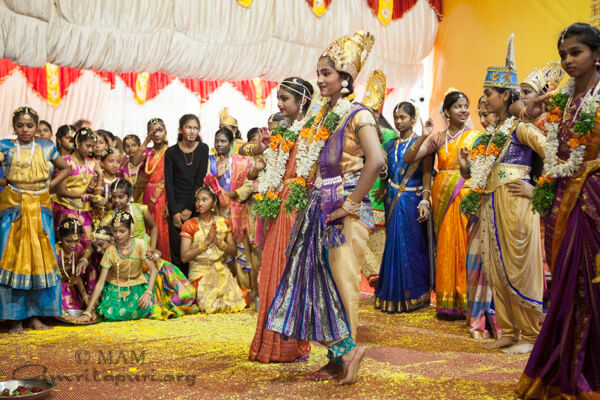 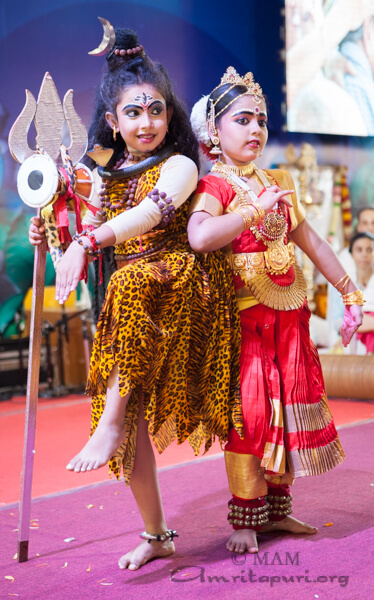 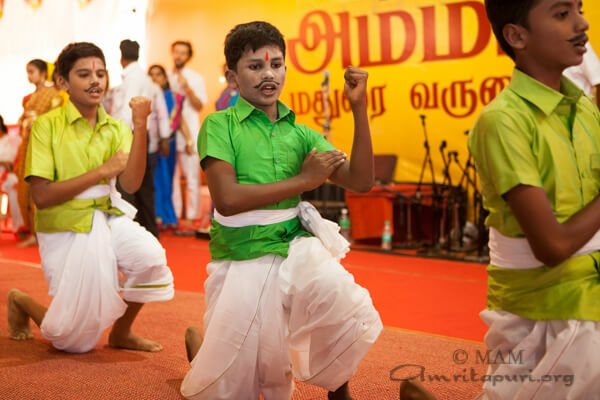 The children of Amrita vidyalayam presented a variety of cultural programs during Amma’s darshan time. 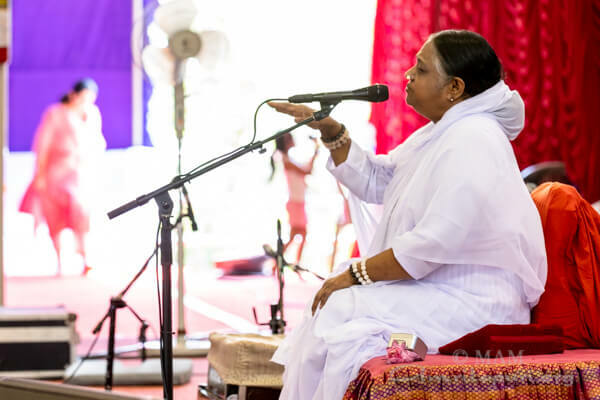 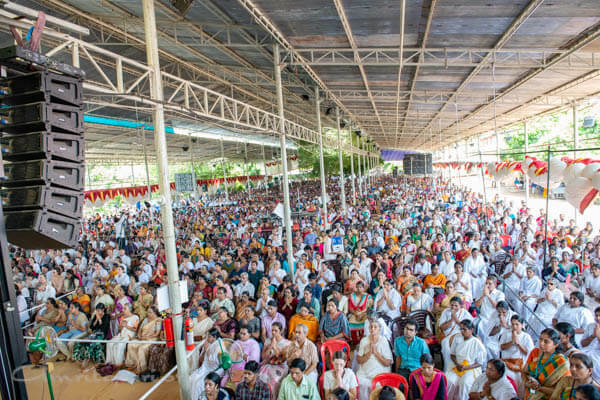 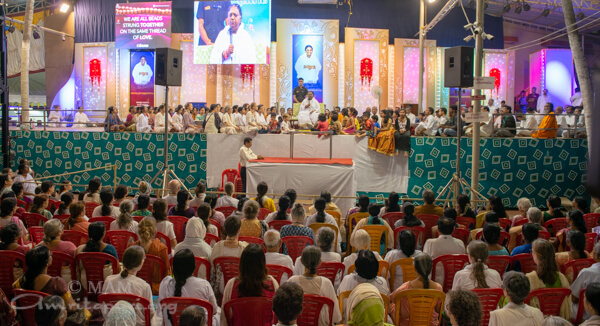 Despite the scorching heat, people were waiting pateintely to see Amma, listen to her and participate in the guided mediatation. 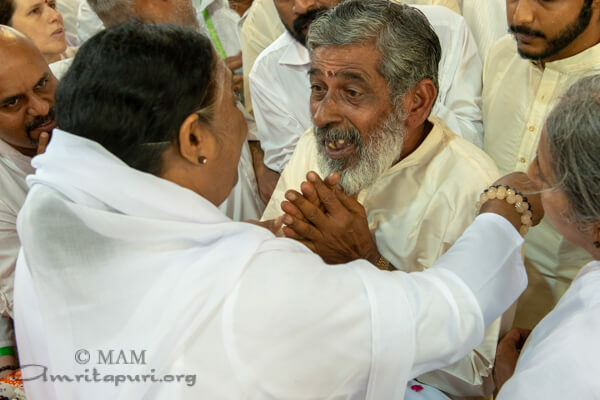 They kept aside everything to spend time with Amma and did not mind the sweat and dust in order to be in the blessed presence of a Mahatma. 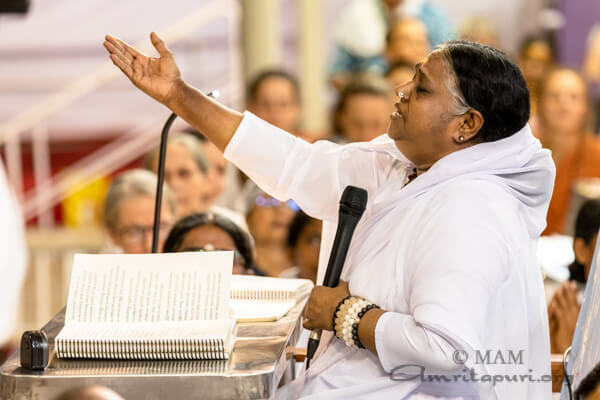 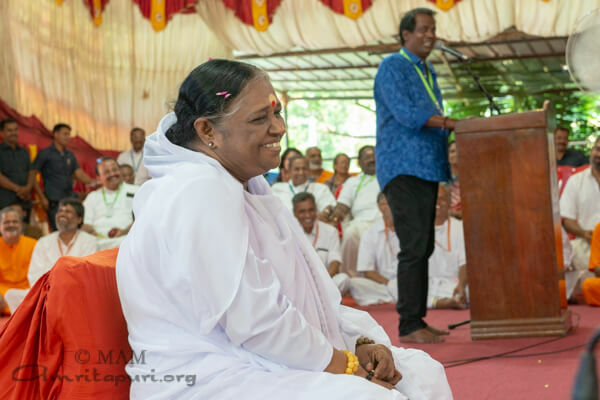 Speaking on the occasion, Amma said: “Just as our body needs good, nutritious food every day, our mind also needs the nutrition of good thoughts every day. 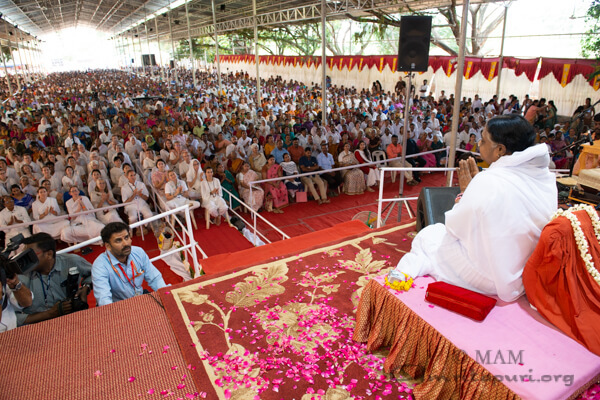 If we eat nothing but junk food, our body will become unhealthy and sick. 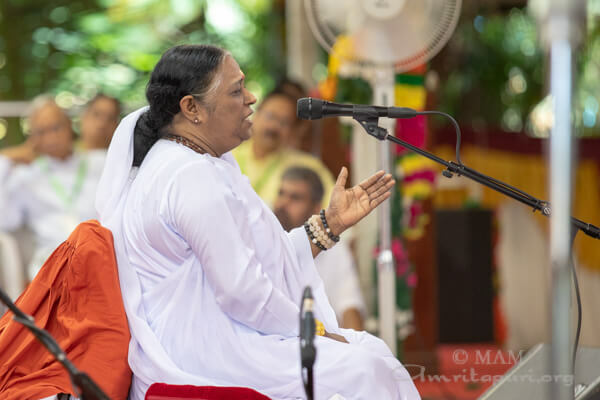 Similarly, bad thoughts will make our mind sick and weak. 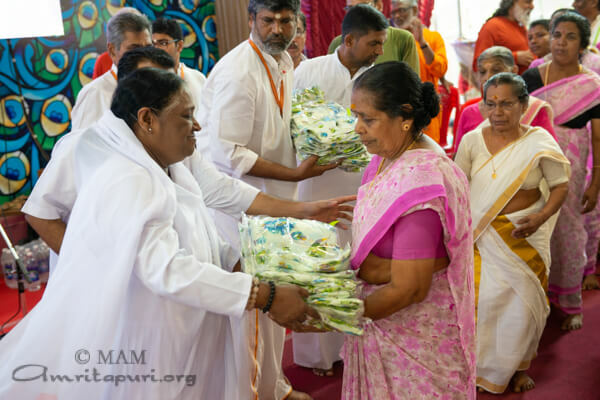 Instead, we must uplift the mind by feeding it pure thoughts. 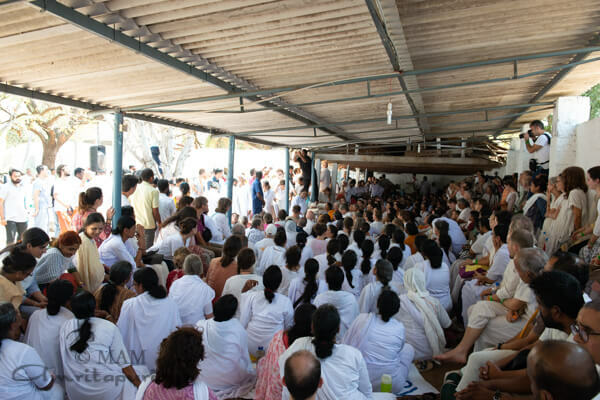 Only then will we obtain peace in life. 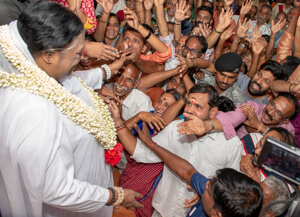 After this last program of Bharata Yatra 2019, Amma left for Australia, where she will hold programmes in four cities on the east coast of the country. 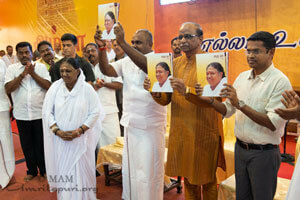 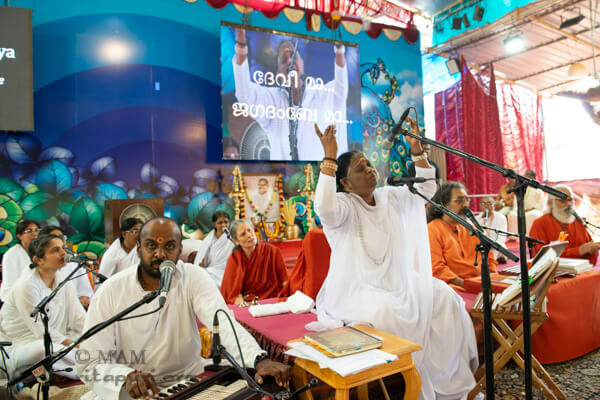 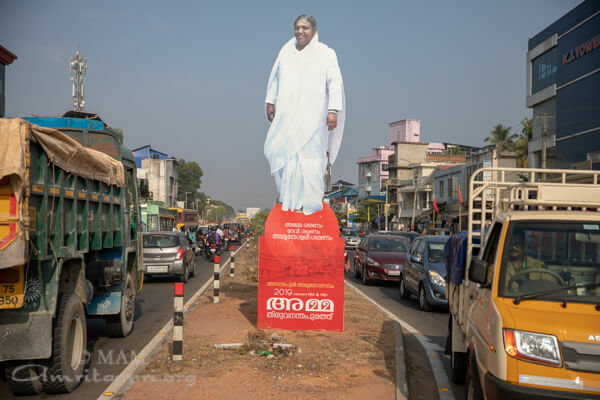 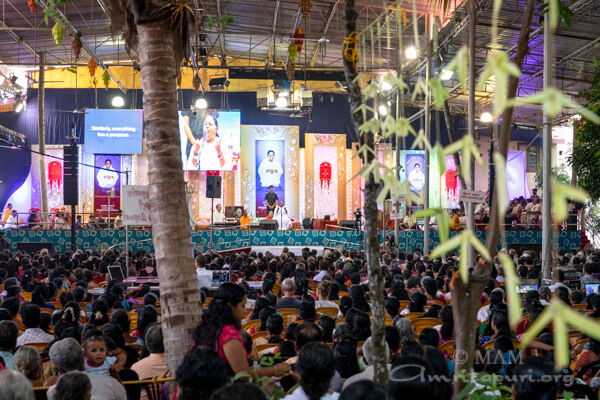 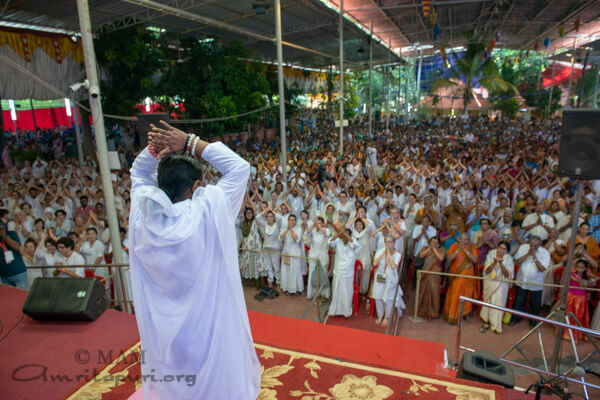 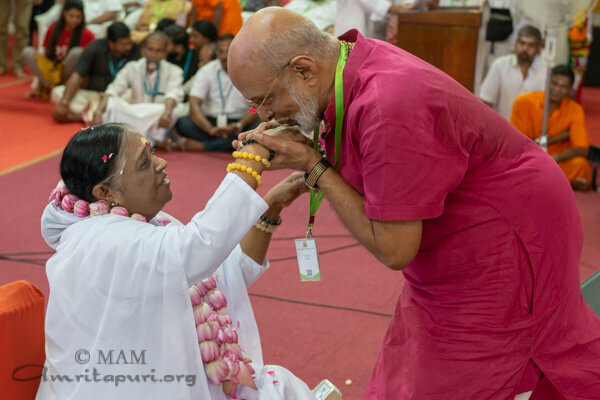 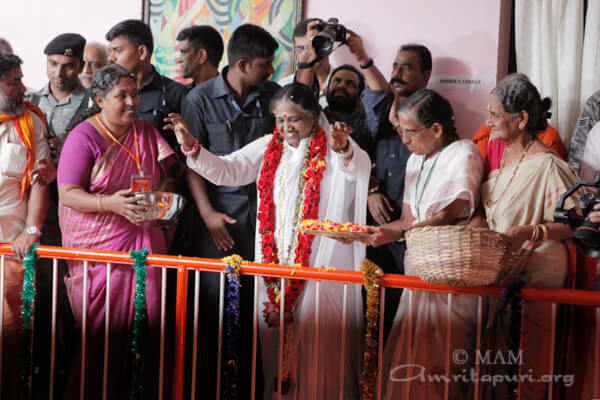 Kochi saw a celebratory tone during Amma’s Bramhasthanam programs. 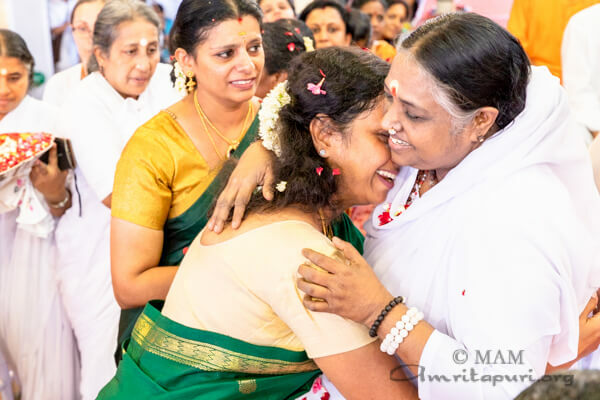 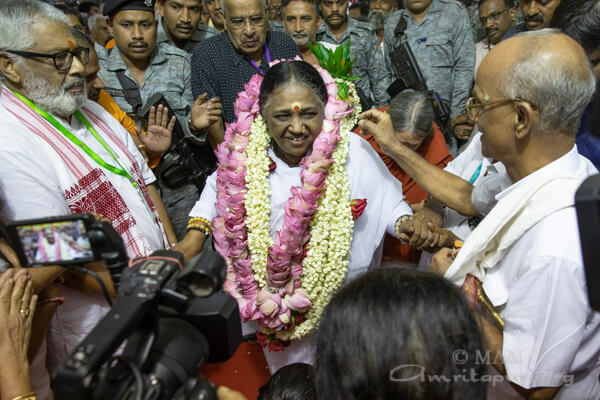 On arrival at 6:40pm from Palakkad on March 15, Amma was welcomed by Vedic Chants from students of Tantra Vidyapeetham, Lalita sahasranamam by students of Amrita Vishwa Vidyapeetham and bhajans by devotees. 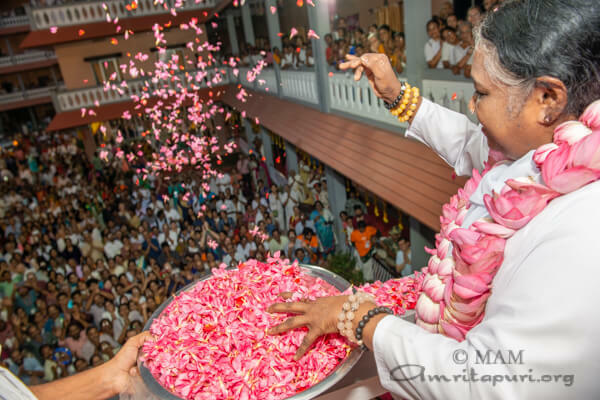 Looking at the crowd from the verandah, she showered flower petals on thousands who had come to see her arrive for the 2-day festival at Ernakulam. 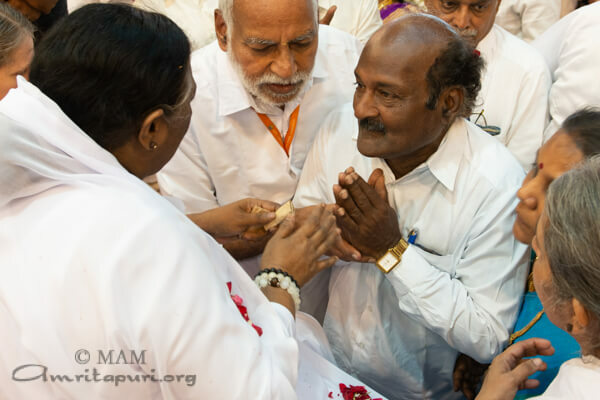 Amma served dinner to everyone present including those of the tour group and local volunteers after leading them in Meditation & Bhajans. 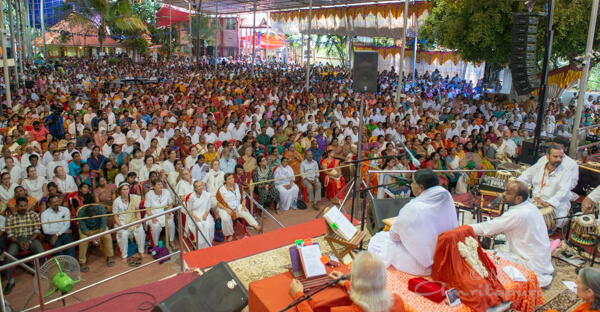 The first day started off with a public program. 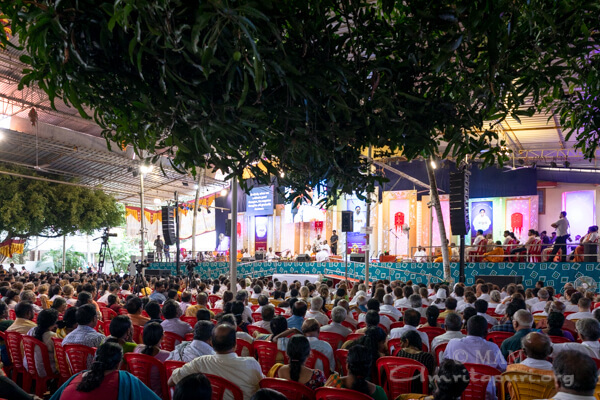 Among the guests on stage, Justice PR Raman, Ombudsman, Devaswom board, said Amma’s service is uplifting many who come to see her. 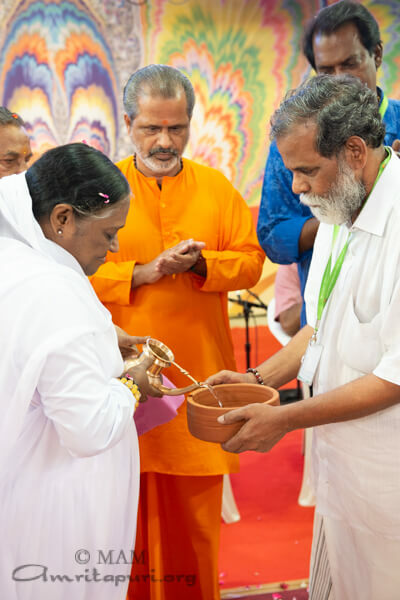 Justice Mohandas of human rights commission spoke of Amma’s clean drinking water project as tackling humanity’s most primary needs and requested everyone to follow the good deeds and example set by Amma. 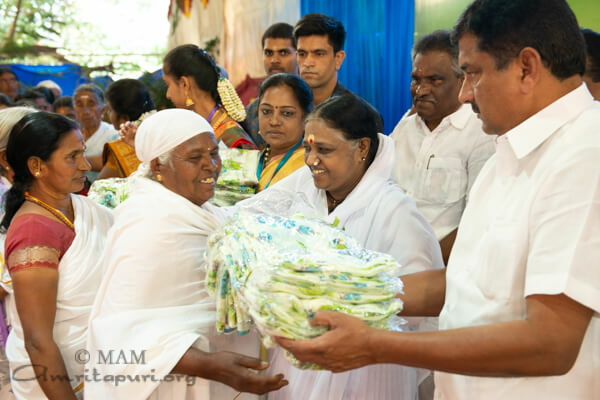 Under Jivamritam clean drinking water project, 3 more units were handed over to communities in Ernakulam area. 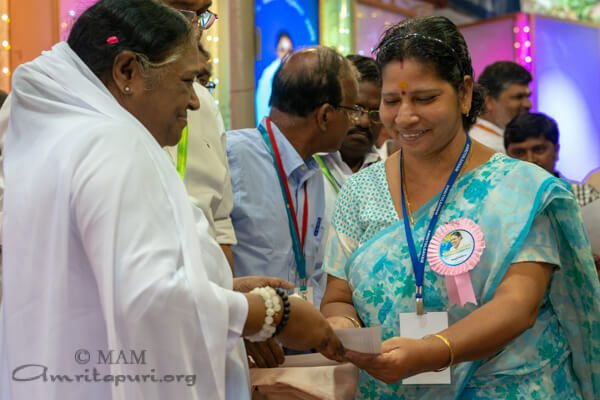 50 people living around Amrita Hospital were given ‘Health Care Cards’ by which they will be getting special benefits for treatment from the hospital. 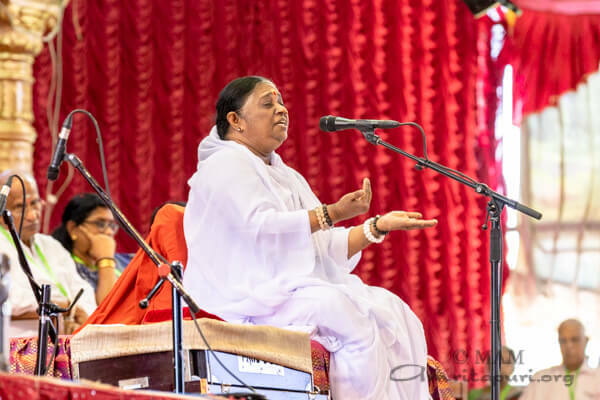 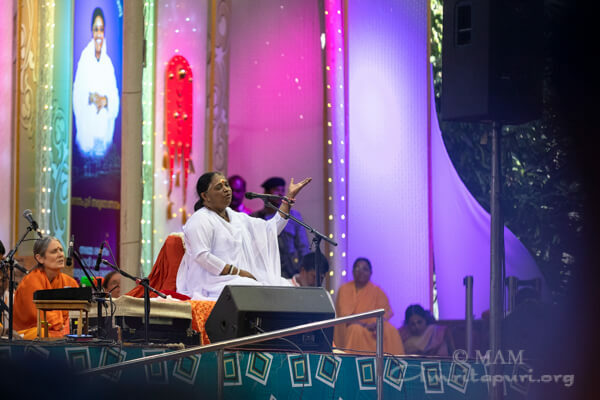 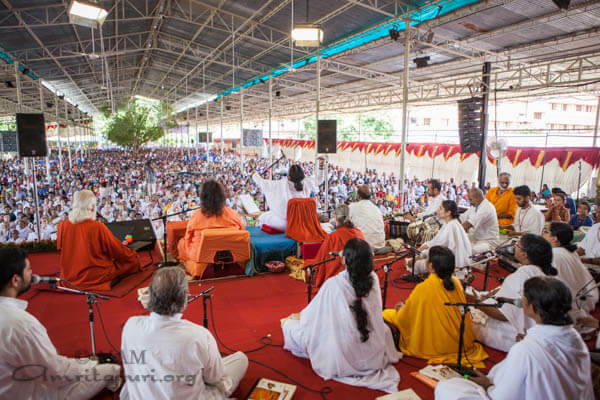 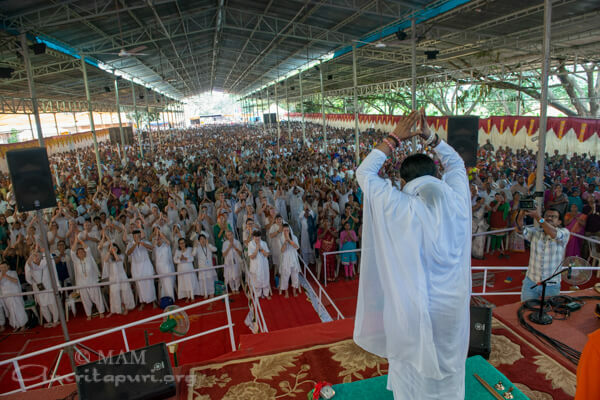 Satsang, Bhajan and meditation were led by Amma before starting each day’s Darshan. 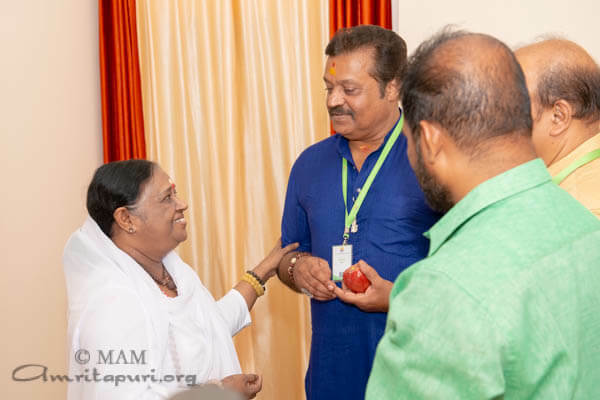 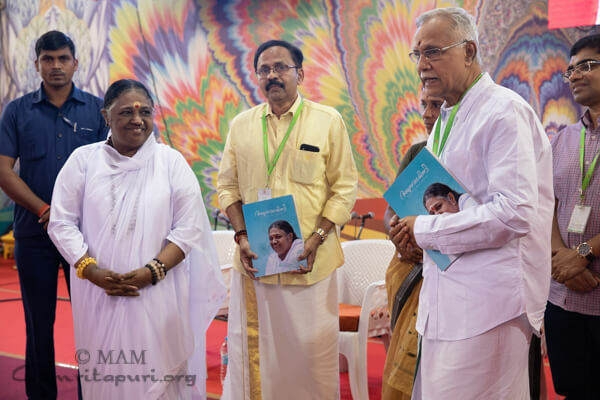 Second day program on the 17th also started with a public event and guests on stage included Malayalam film actor, Salim Kumar who spoke of repeated meetings with Amma as a refuel run for his happiness and how Amma helped him at times of illness and personal difficulty. 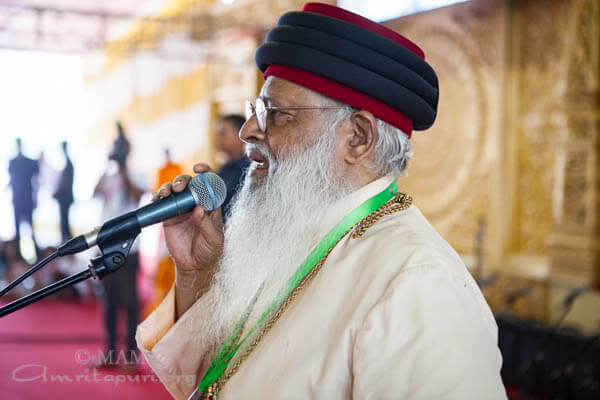 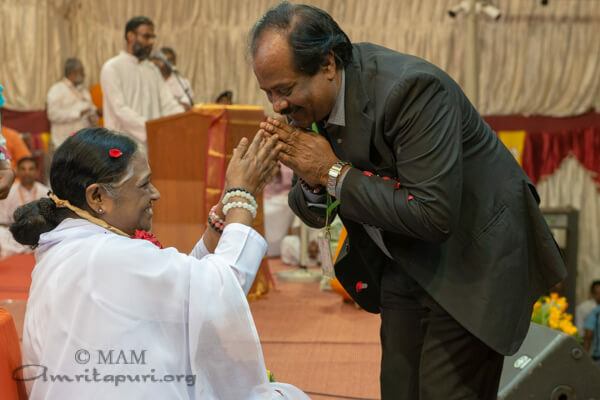 Advocate Govind K Bharathan, Senior Central Government Standing Counsel in the High Court, a guest on stage, spoke of his first meeting of Amma 35 years ago. 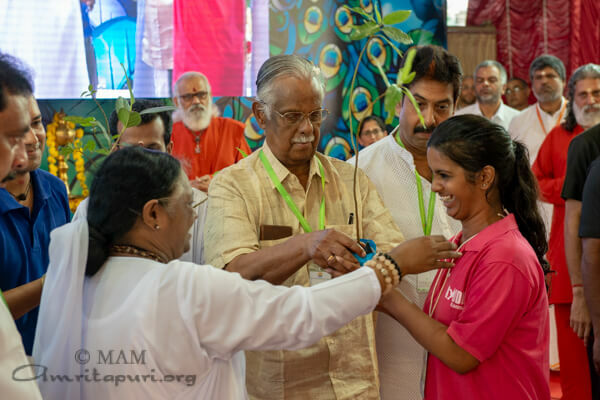 During the public program, Amma distributed plants to AYUDH youth members as part of an ongoing campaign with the theme “Nalpamaram Natinnu Nalvaram – നാല്പാമരം നാടിന്നു നൽവരം”. 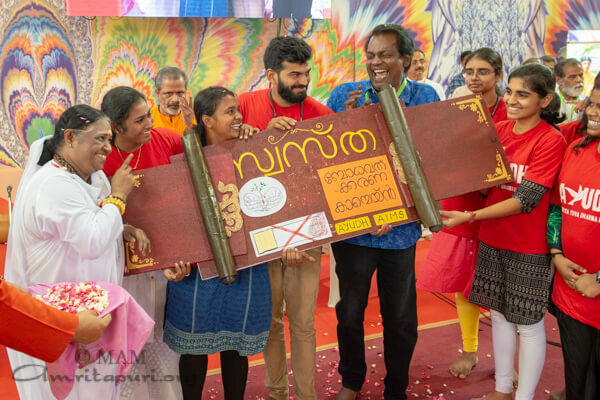 Anti substance-abuse awareness campaign “Swastha” for students and parents in educational institutions was initiated by AIMS Kochi chapter of AYUDH India. A project “jeeva jalattinnu oru maṇpātraṁ – ജീവജലത്തിന്നു ഒരു മൺപാത്രം ” to provide water to birds on earthen plates during hot seasons was also blessed by Amma during the public program. 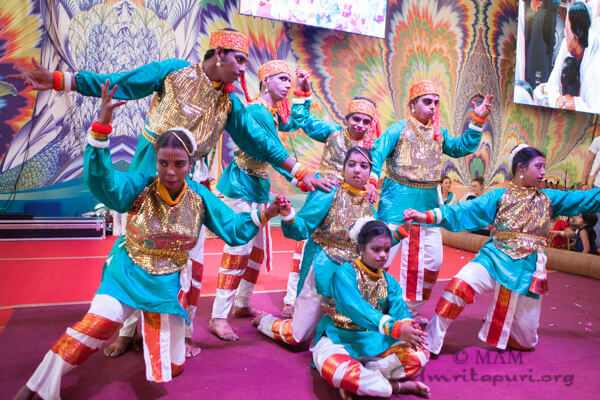 A group of young students from Amrita Institute for the Differently-Abled (AIDA) touched many through their graceful yet delicate dance performance. 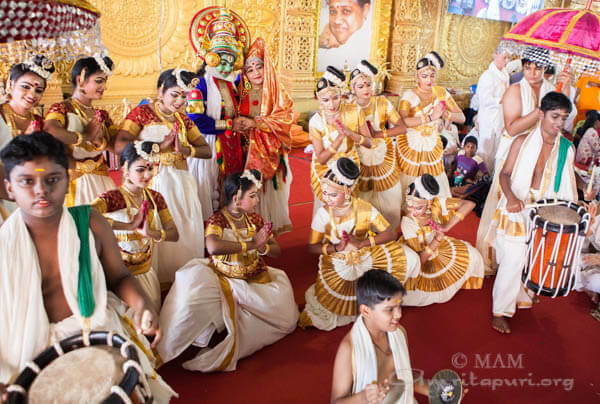 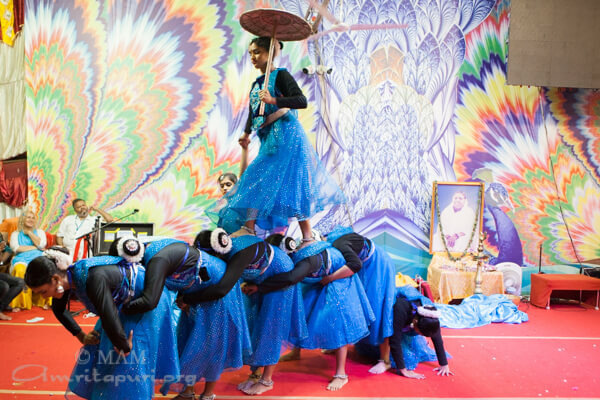 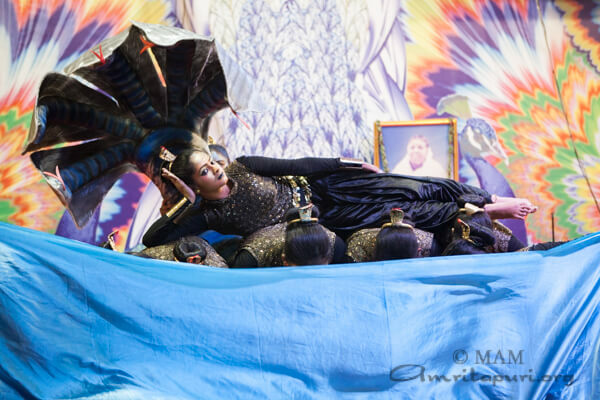 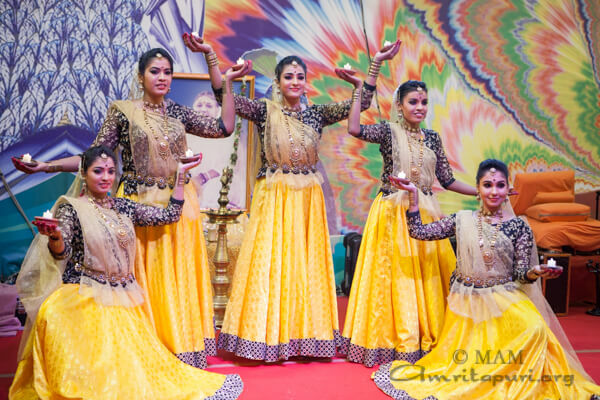 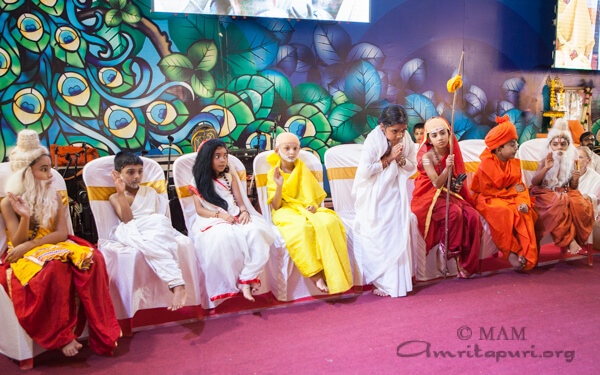 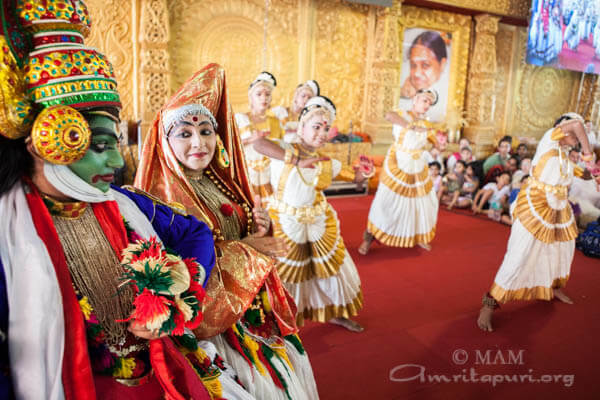 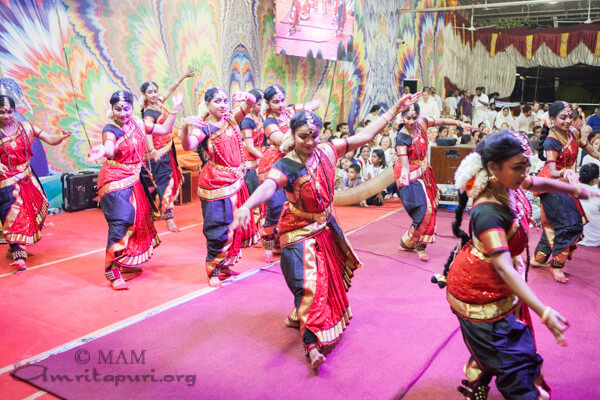 Students from Amrita Vishwa Vidyapeetham and Amrita Vidyalayam performed many dances and music as Amma gave Darshan. 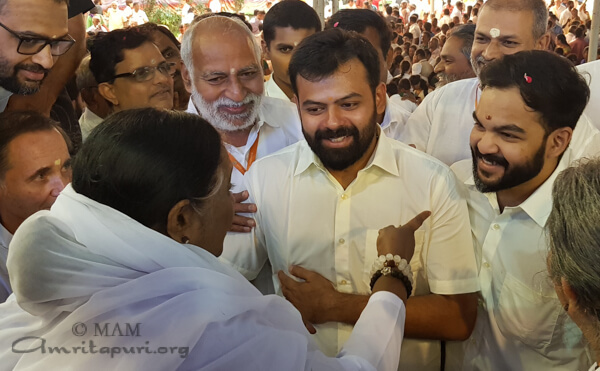 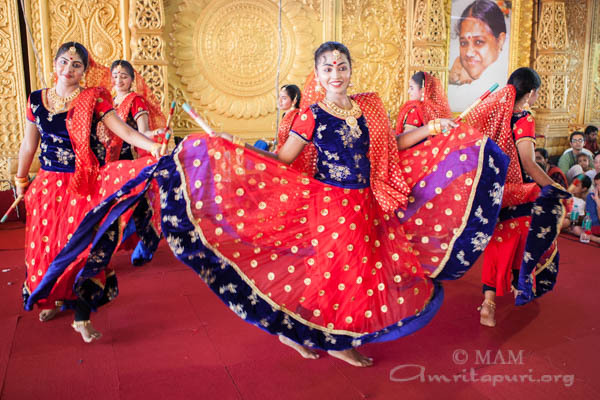 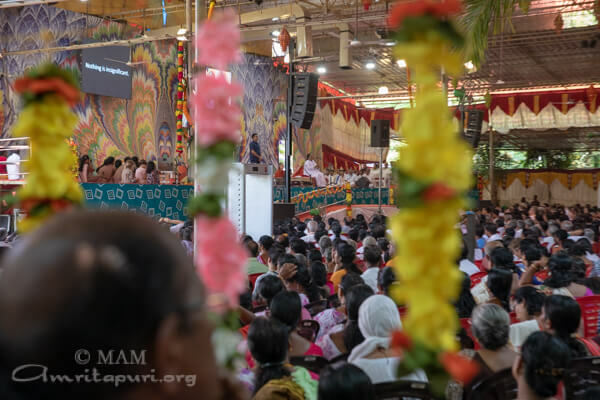 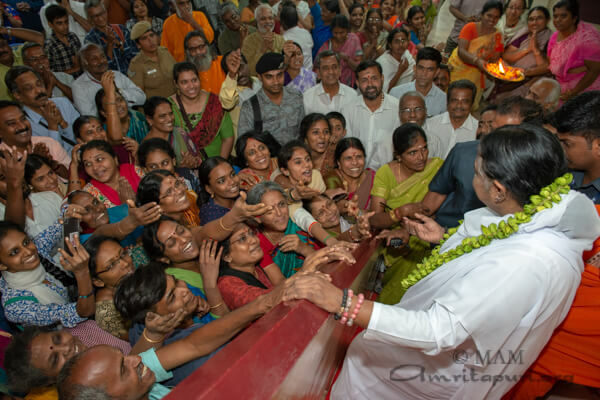 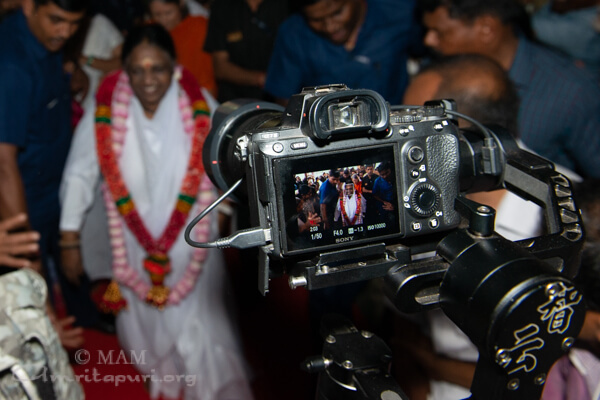 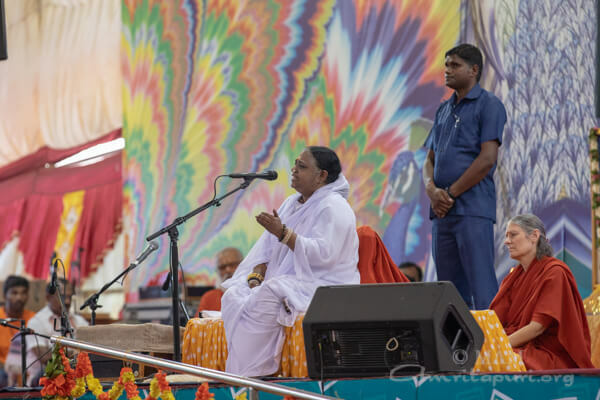 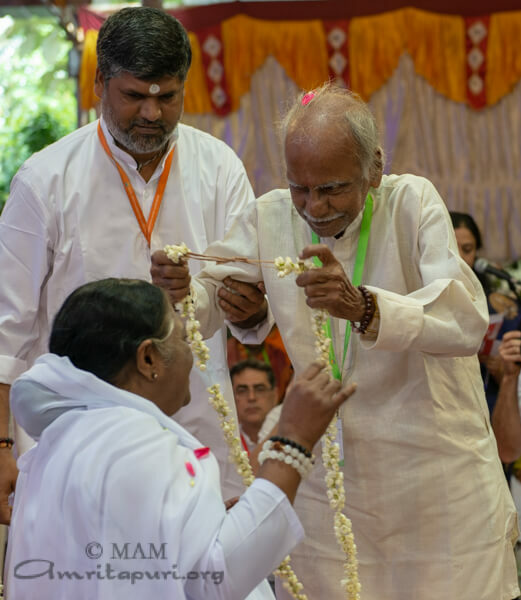 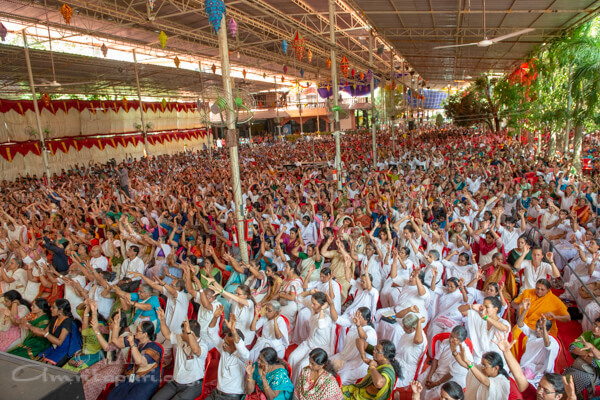 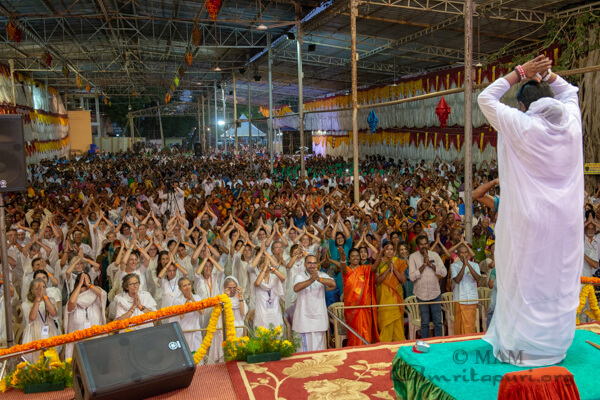 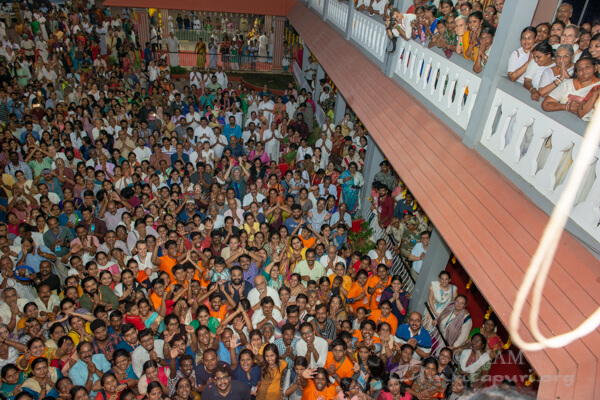 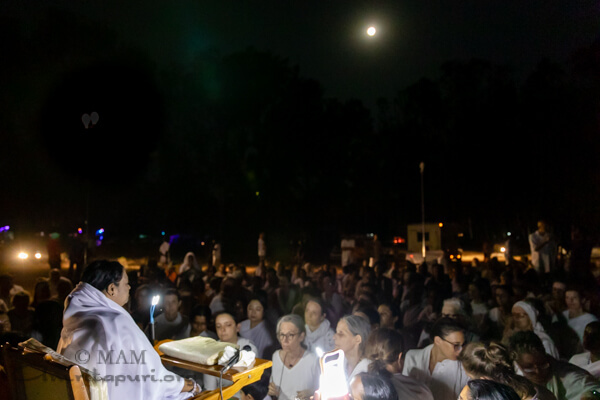 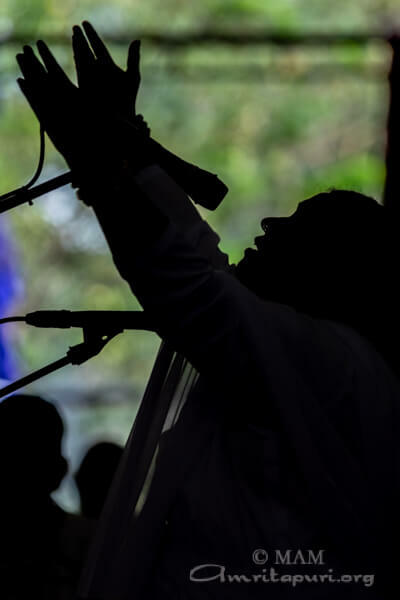 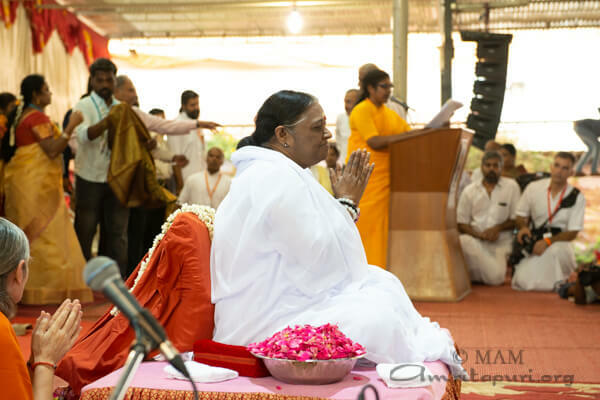 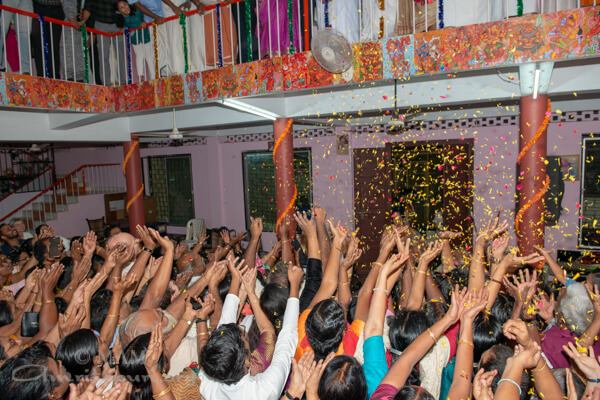 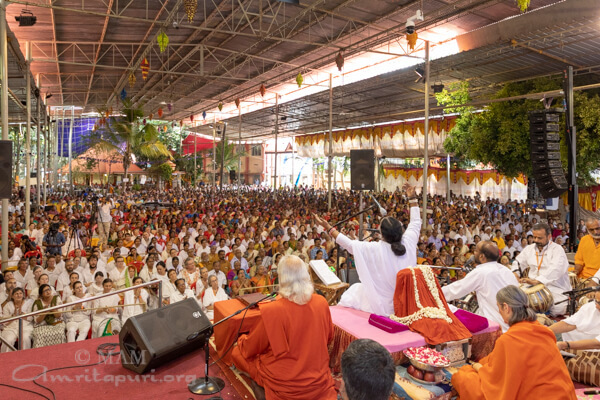 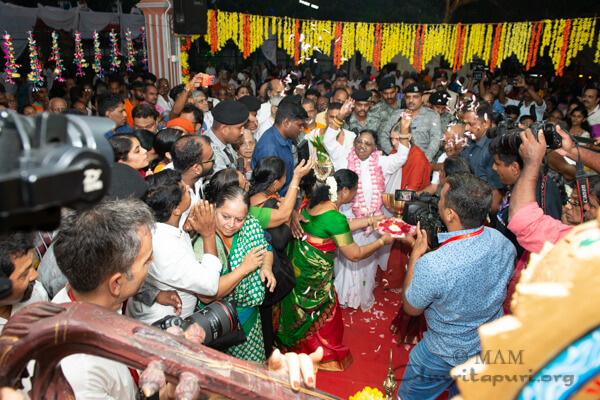 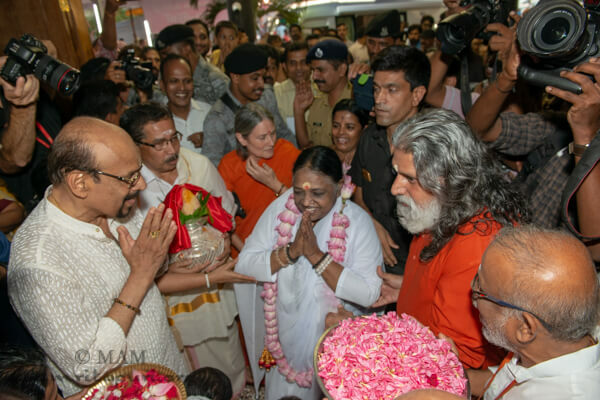 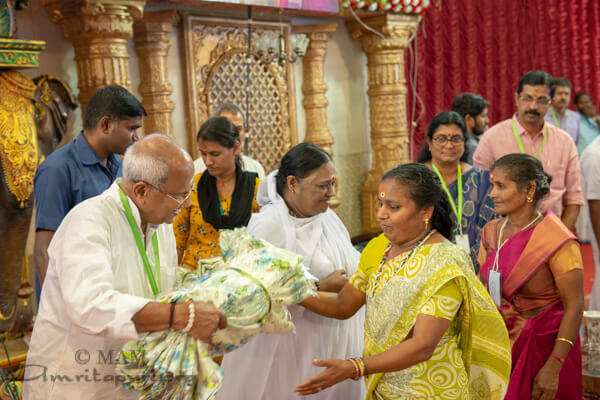 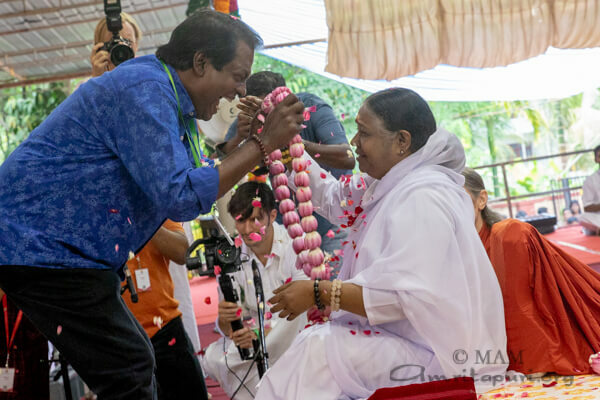 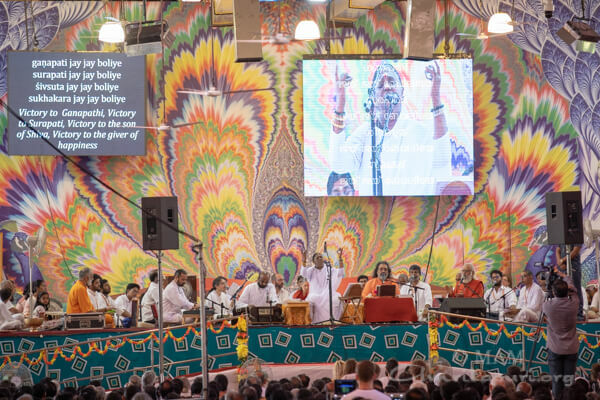 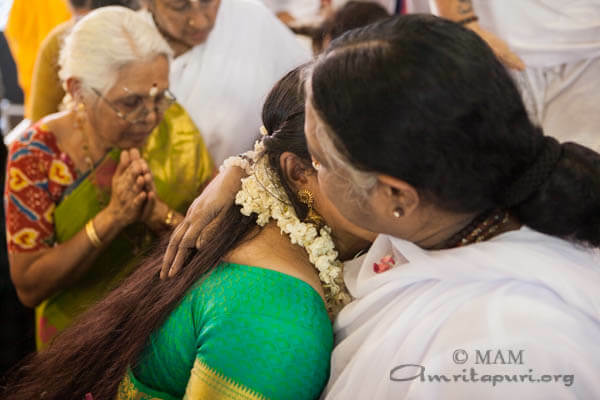 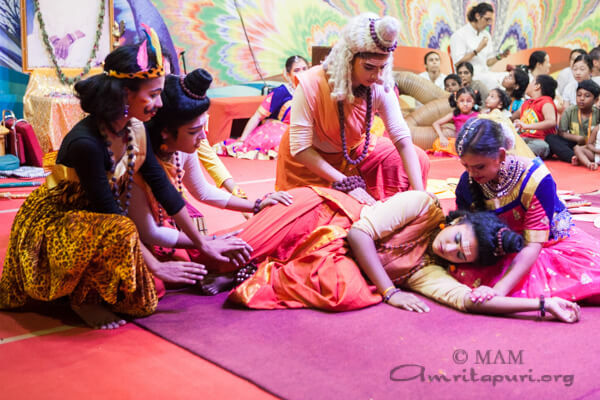 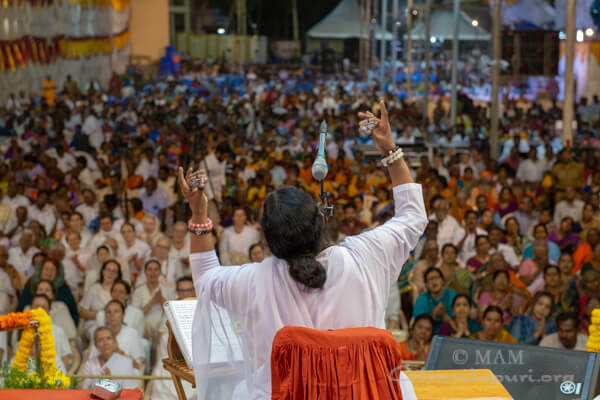 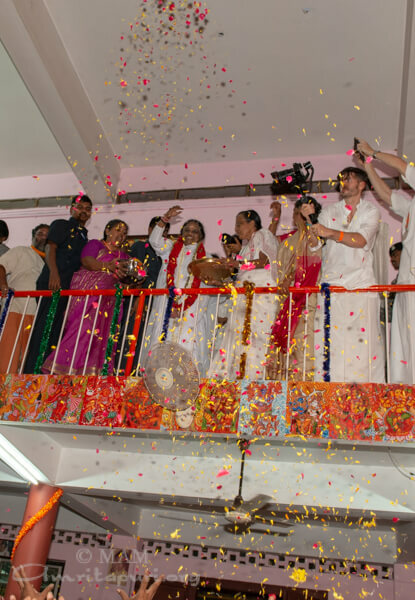 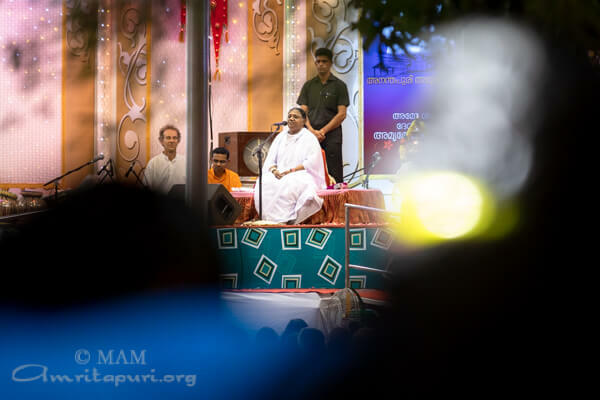 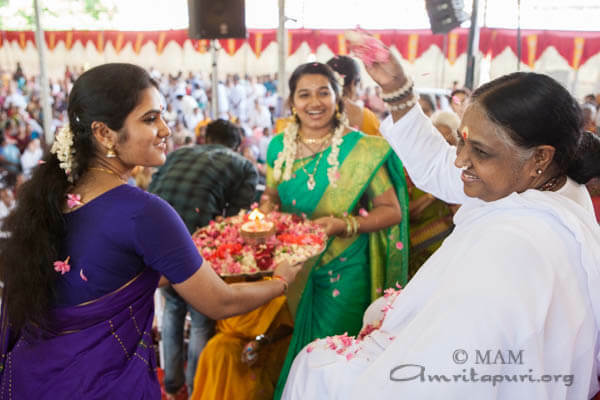 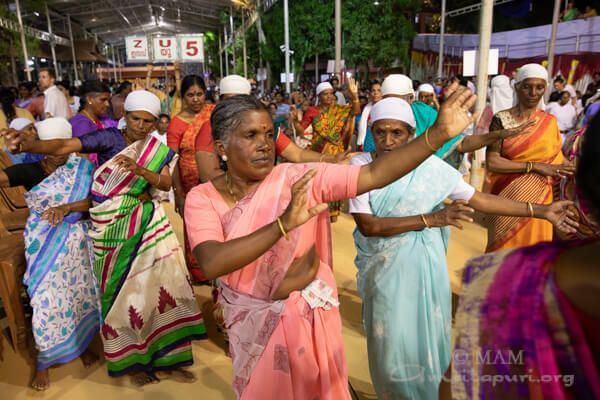 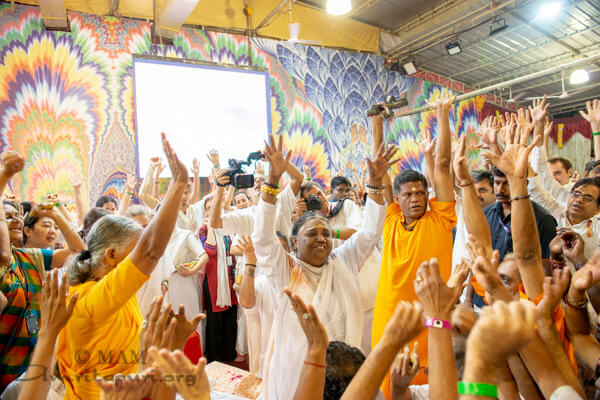 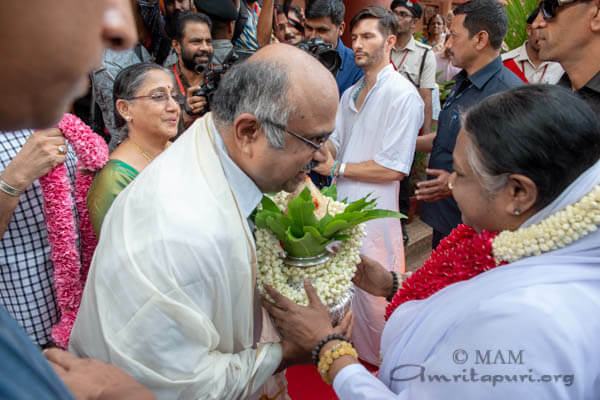 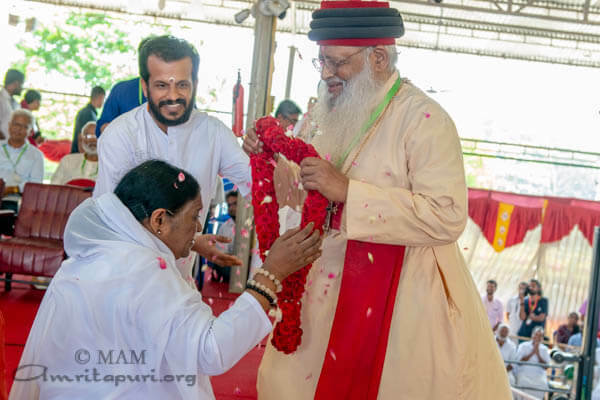 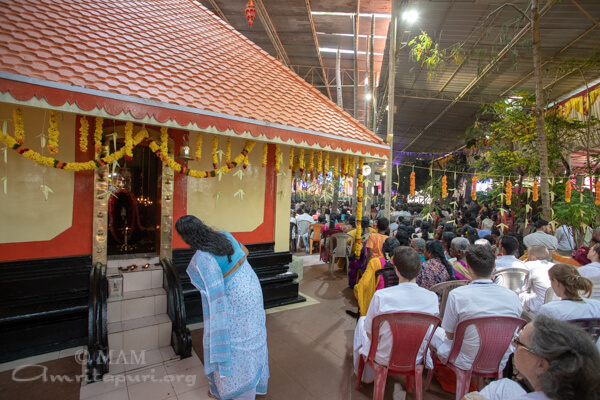 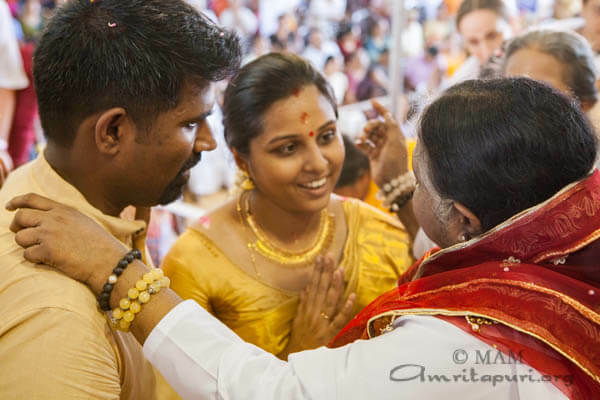 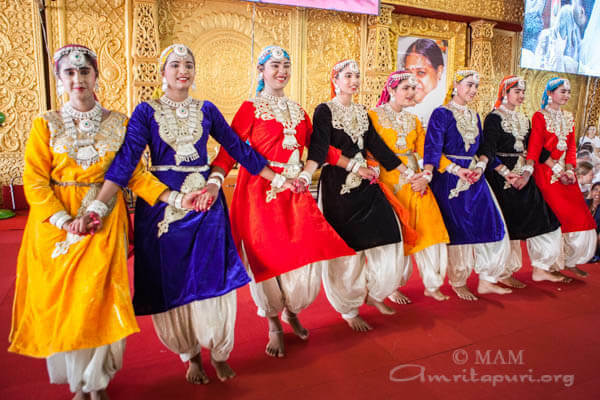 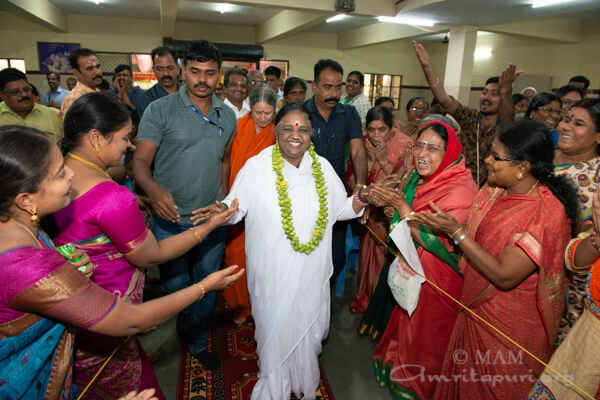 At 3:30 am on the next day, as Amma got up from the stage, chants of “Mata Rani Ki” and jubilation reminded that this was also the auspicious ending to the second leg of Amma’s Yatra that started at Mysuru on February 18, 2019. 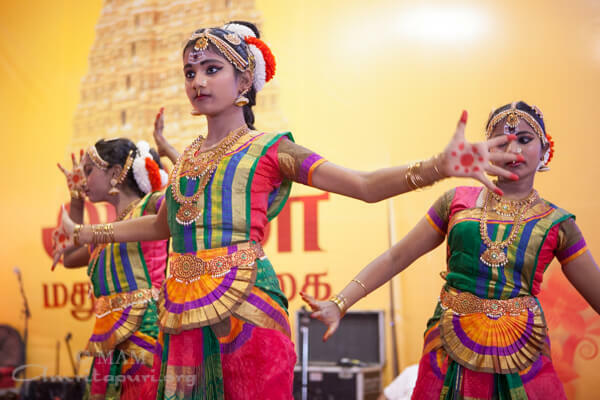 For the next stop, the tour group traveled to Palakkad, just next to the border of Kerala and Tamil Nadu. 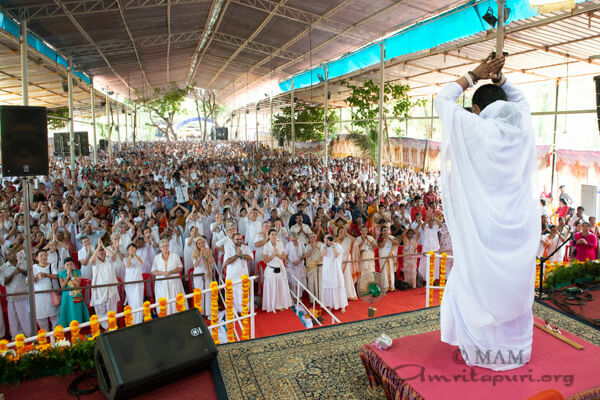 During the two days of programs the temperatures soared, reaching a high of 43 degrees C! 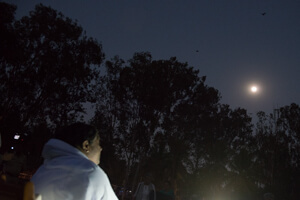 (109 degrees F). 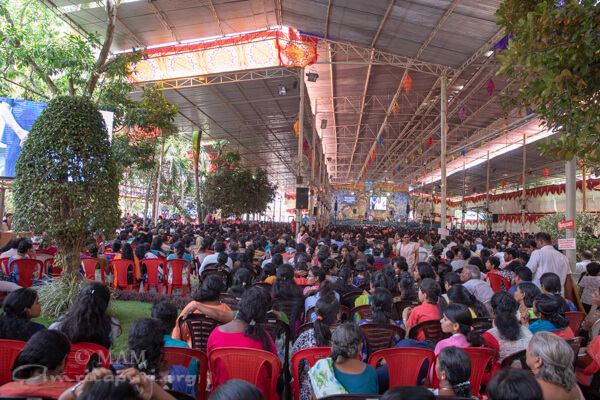 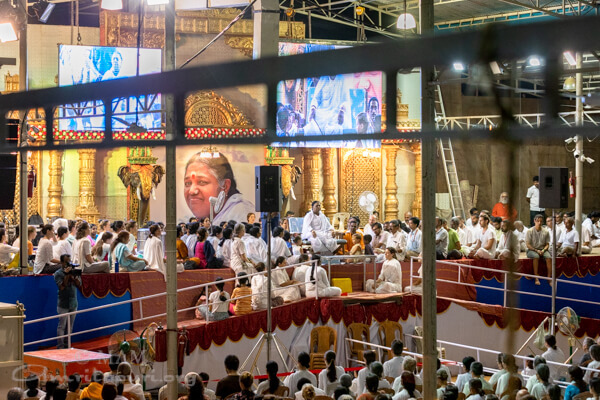 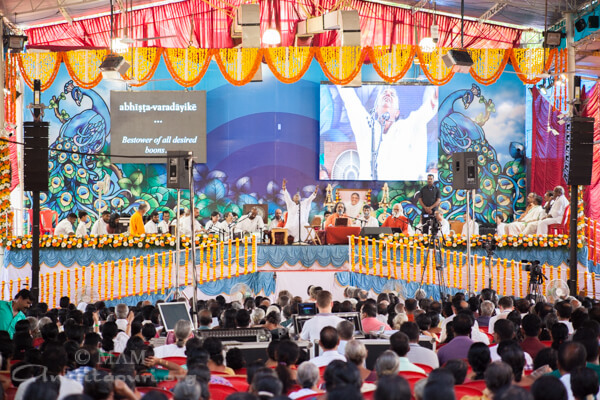 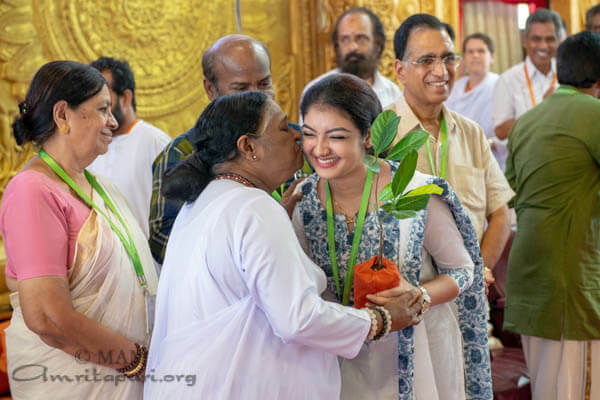 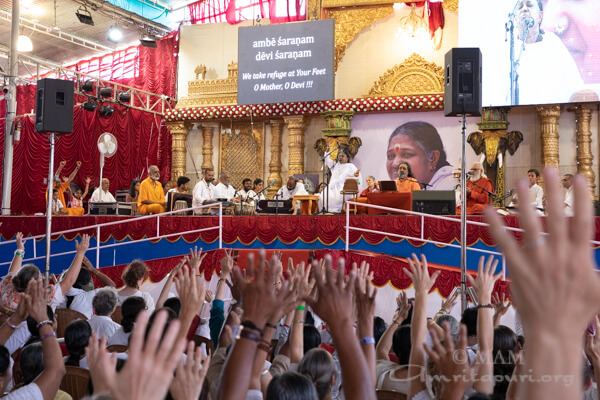 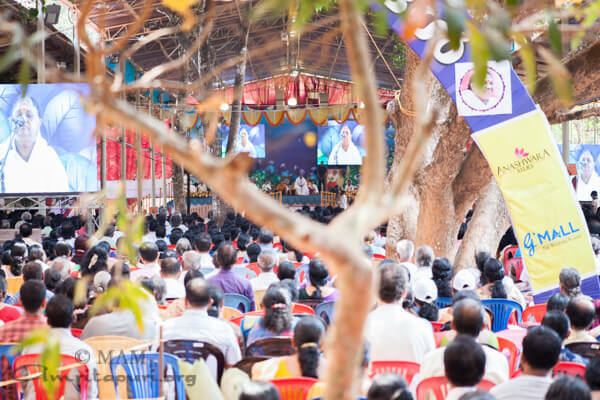 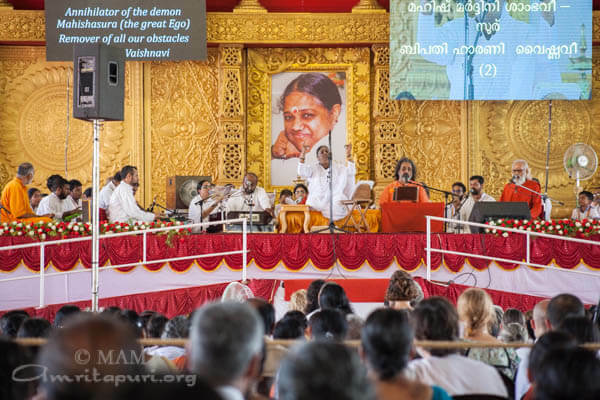 For all those in attendance, sitting in the massive crowds and intense heat, Amma’s words and embrace became a soothing breeze, cooling the hearts of thousands who came to see her. 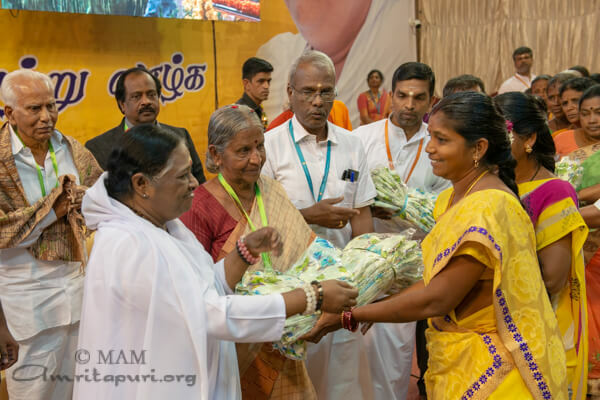 During the program, Amma distributed saris to local Amrita SREE self help group members and Amrita Vidyalayam students presented a variety of cultural programs. 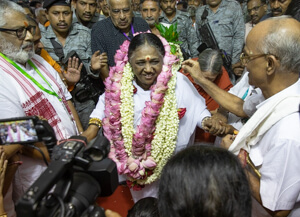 After the Palakkad programs the tour group had a short drive to Kochi for the final stop on the Bharata Yatra2019. 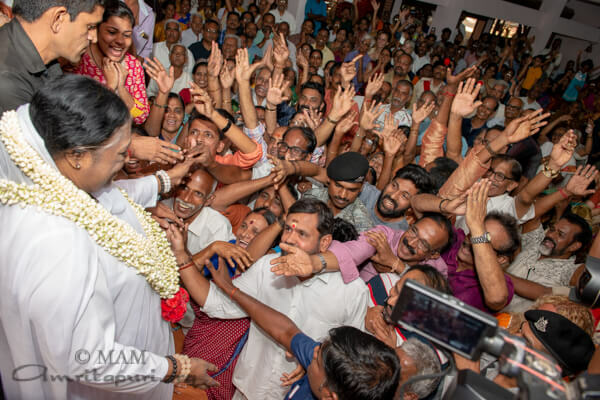 After several weeks spent in the states of Karnataka, Andra Pradesh and Maharashtra, Amma finally made it back to Kerala and had her first program back in the north of the state in Kannur. 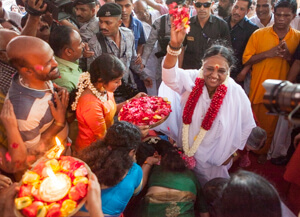 Amma held two days of a Brahmasthanam festival there. 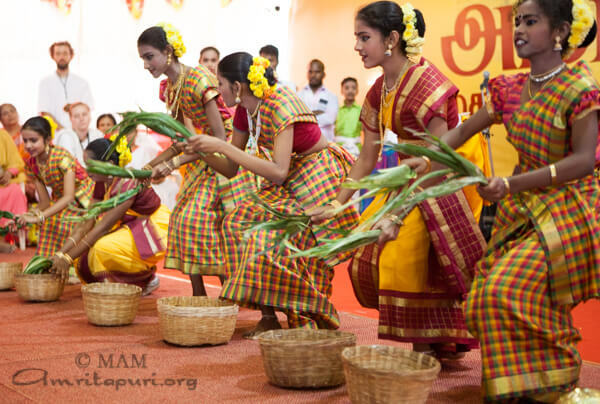 From the big city atmosphere programs of Mumbai, Bangalore, Hyderabad, etc; coming back to Kerala, the programs took on a more rural feel and village atmosphere. 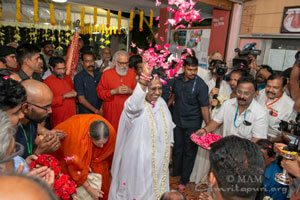 The Kannur ashram is set back far from the main road down a small lane. 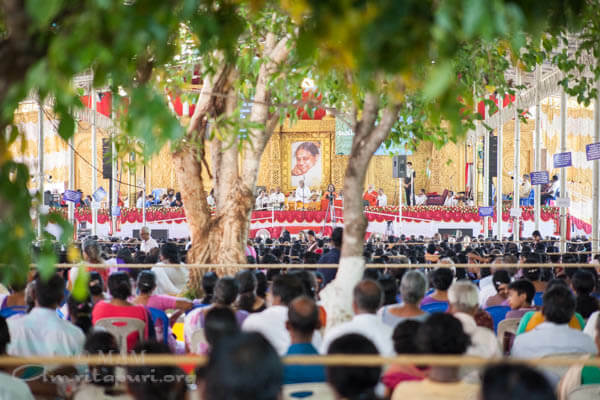 Each day Amma descended to the stage via a long ramp passing through the branches of jackfruit, mango and cashew nut trees. 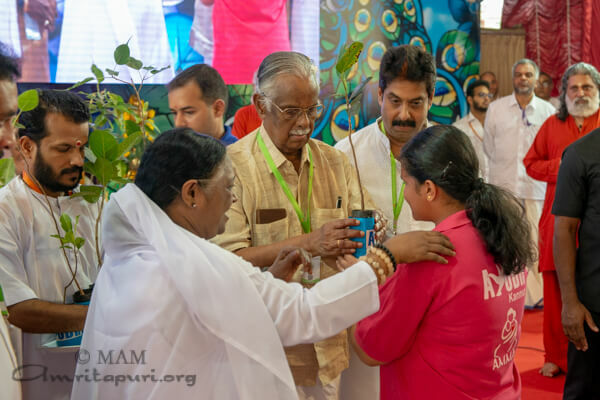 Amma was welcomed to Kannur by the famous writer, T Padmanabhan, who helped distribute saplings to local AYUDH members promoting the ‘Nalpamaram Natinnu Nalvaram’ നാല്പാമരം നാടിന്നു നൽവരം” project to plant medicinal trees in temples and ‘Kavu’ (sacred groves). 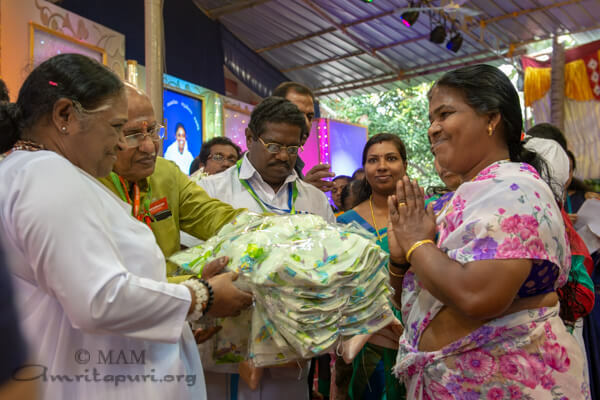 Saris were also distributed for AmritaSREE self help group members. 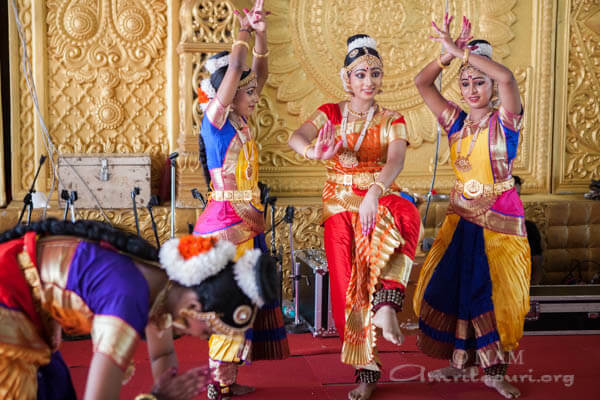 During darshan, local Amrita Vidyalayam children performed various dances and dramas that they had obviously worked very hard to prepare. 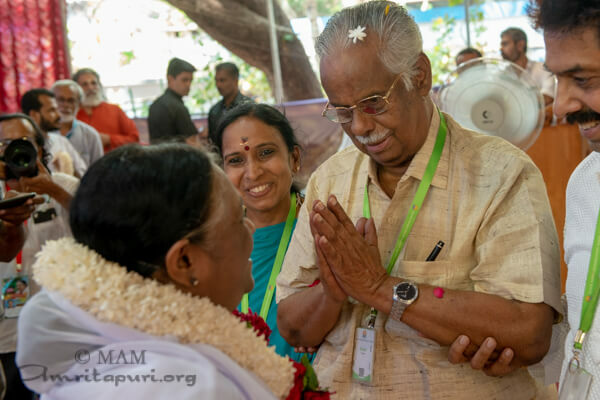 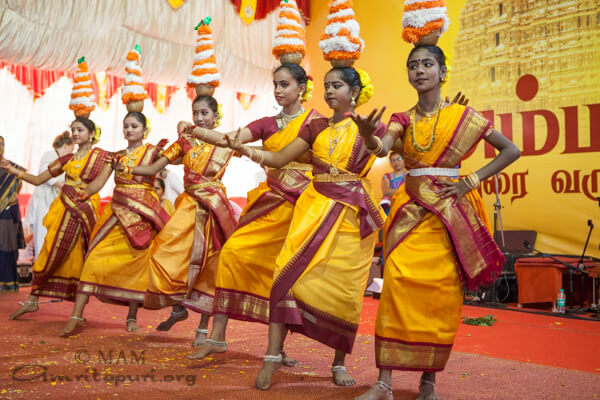 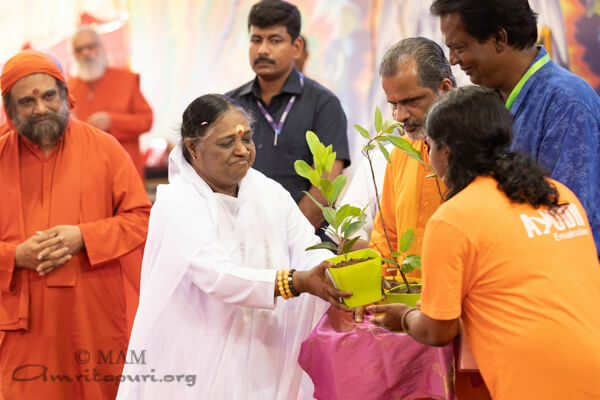 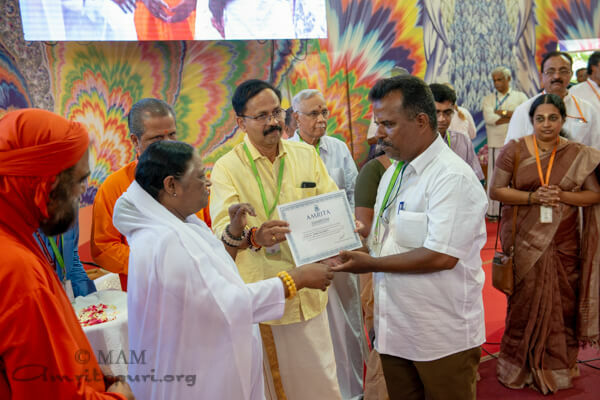 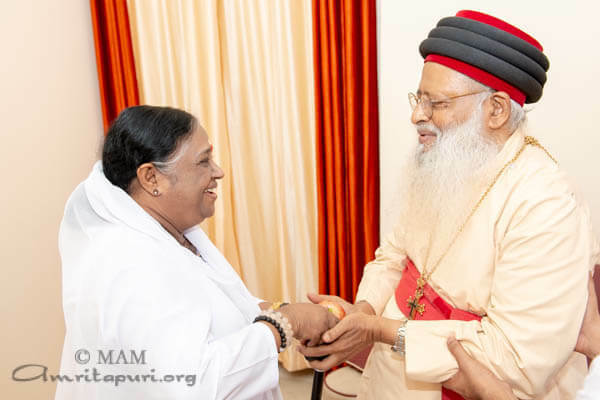 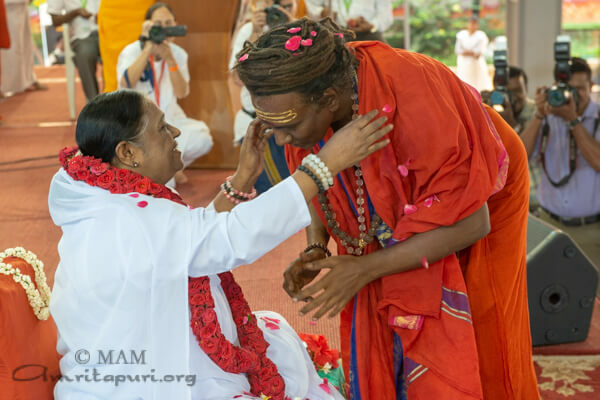 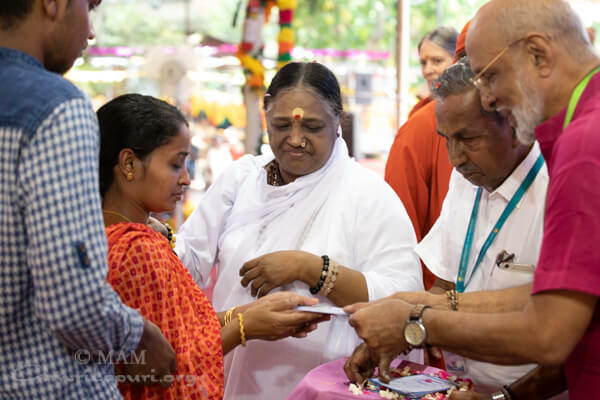 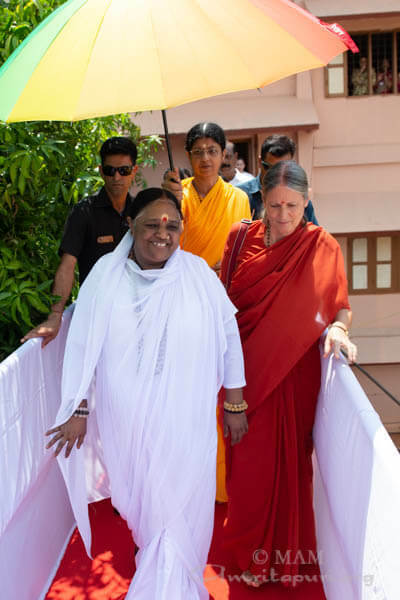 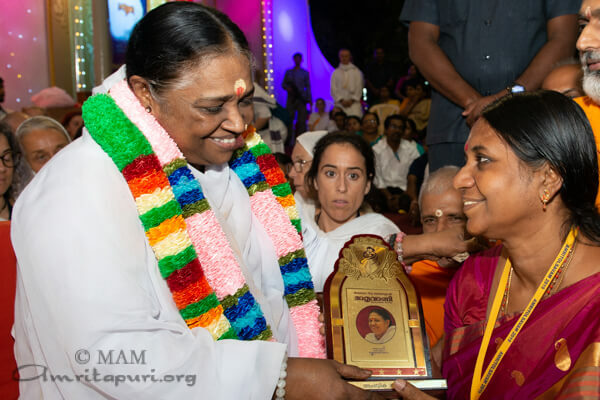 At the end of darshan Amma honored local devotees who teach ‘Bala Samkruti’ classes, imparting spiritual and cultural values to local children. 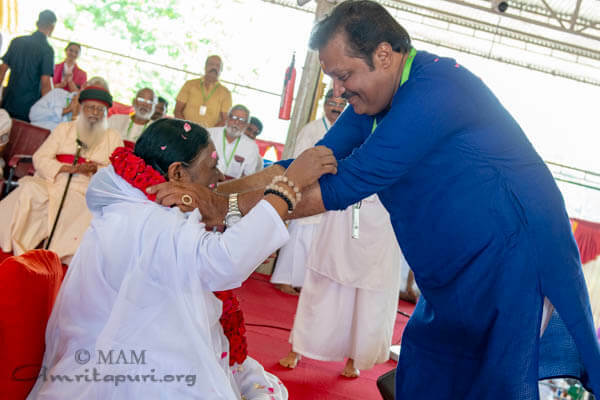 After the final person was embraced, Amma and the tour group continued south to Palakkad for the next stop on the tour. 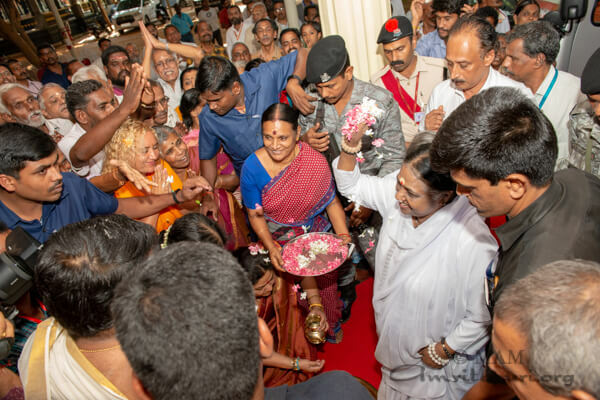 Amma began her 2019 Bharata Yatra with programmes in Tiruvananthapuram. 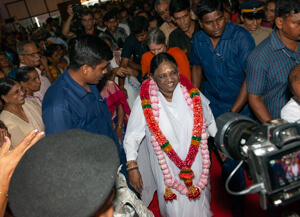 Amma was welcomed to the region and lauded by many dignitaries, including Sri O.Rajagopal MLA; Sri V.S.Sivakumar, MLA; Amritakeerti Puraskar winner and acclaimed writer Sri Narayana Kurup; and Sri Babu Chandran Nair, DIG of BSF. 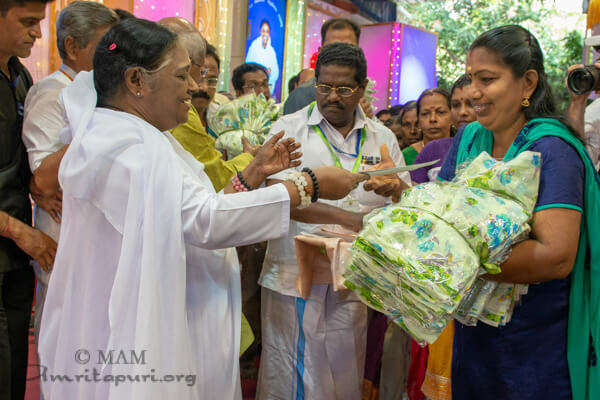 During the programmes, Amma distributed new saris to Amrita SREE self-help group members and also awarded certificates of completion of five units* to Panchayat members of the Mata Amritanandamayi Math’s Jivamritam project to install water filters and provide clean drinking water in 5,000 villages throughout India. 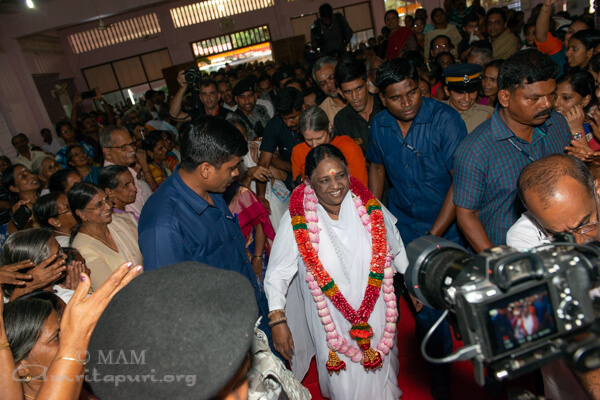 In her talk, Amma stressed the need for love and compassion in society. 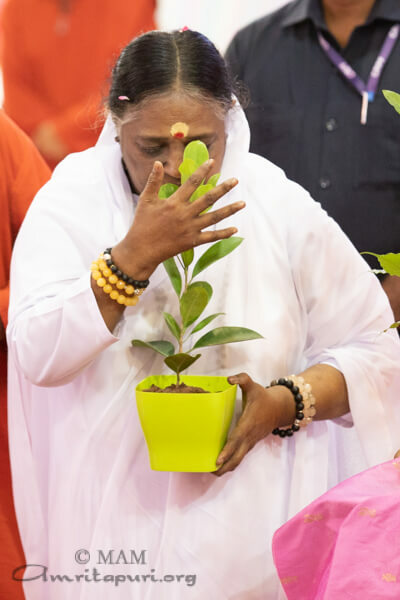 She also stressed the importance of protecting nature to ensure a sustainable future for humanity. 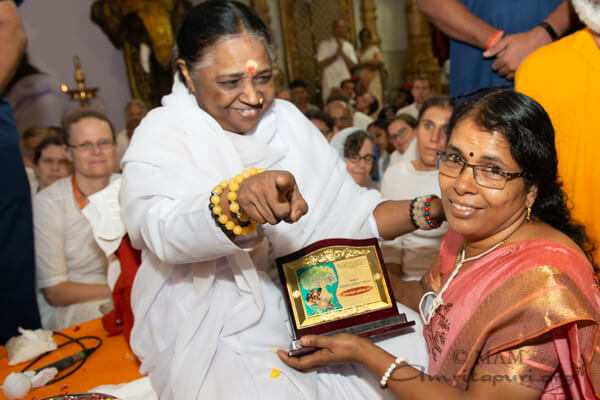 Further, she pointed out the importance of parents inculcating spiritual values like self-control and compassion for others in their children. 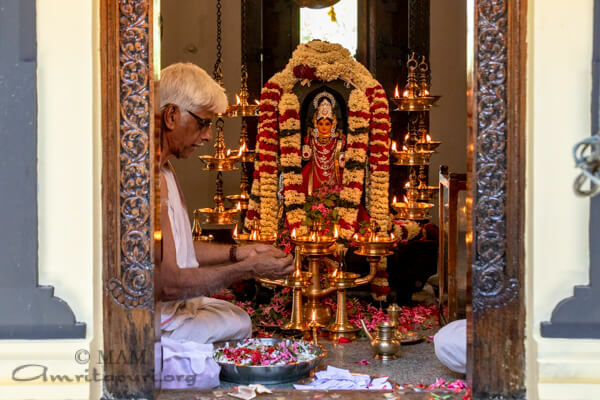 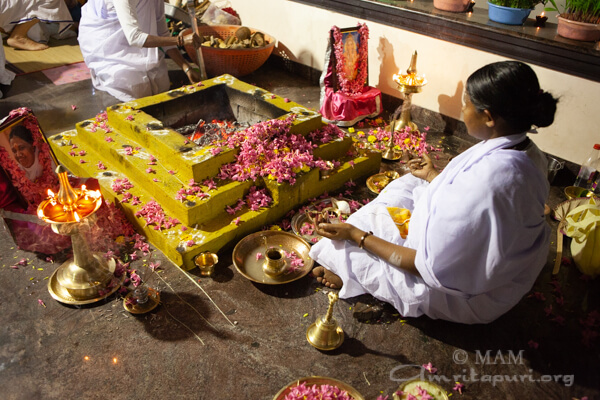 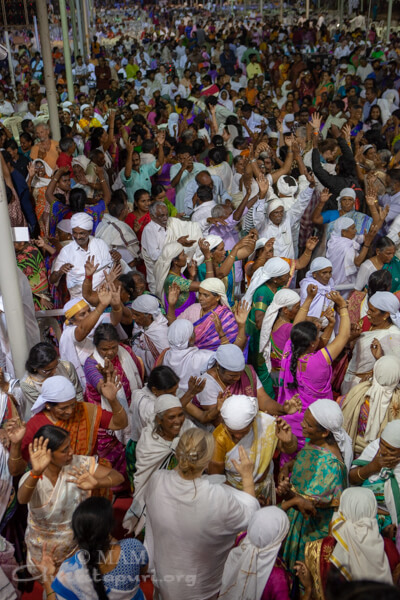 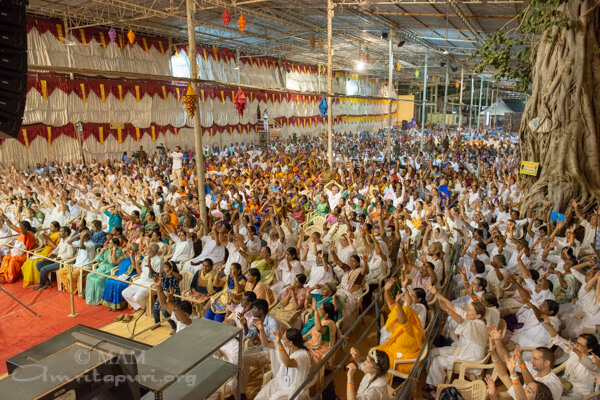 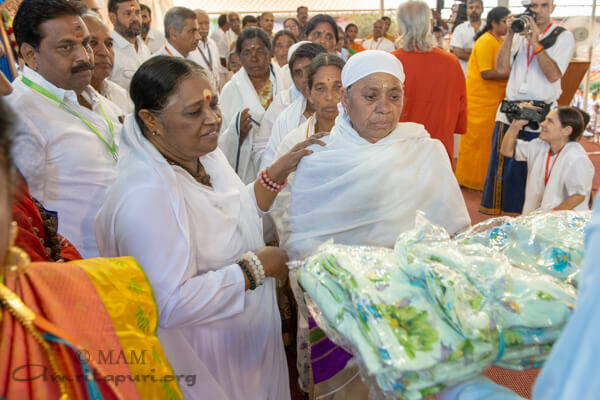 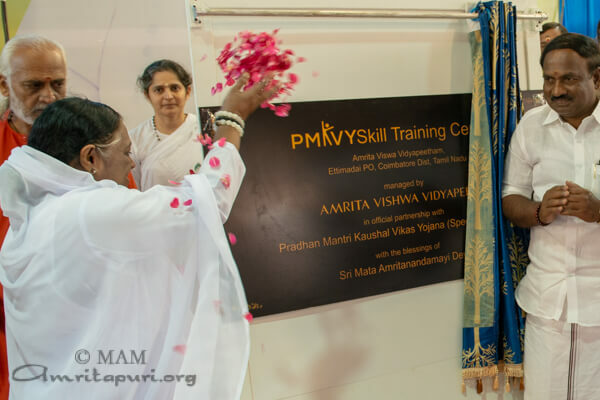 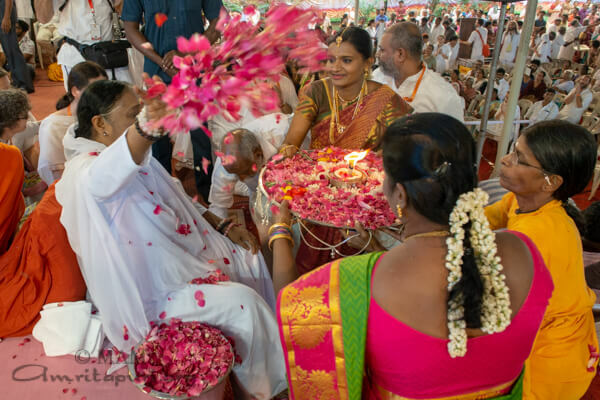 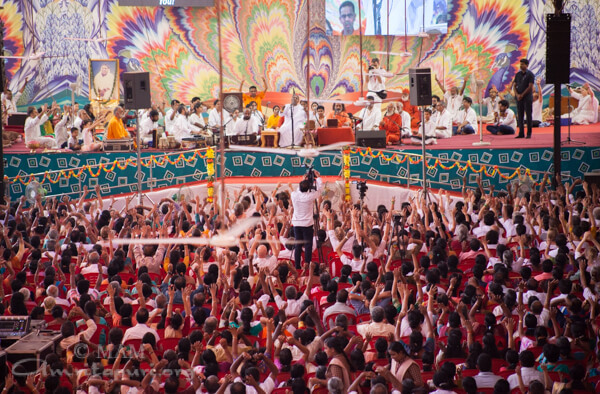 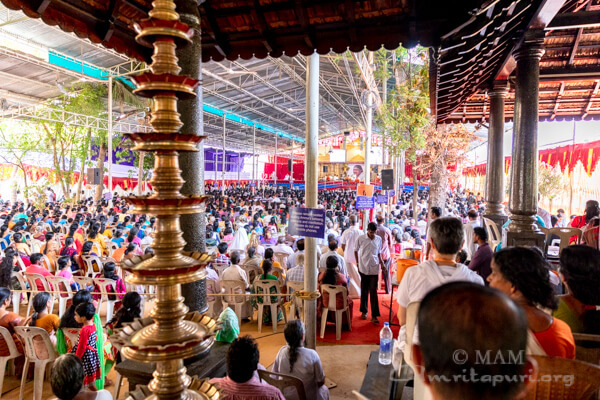 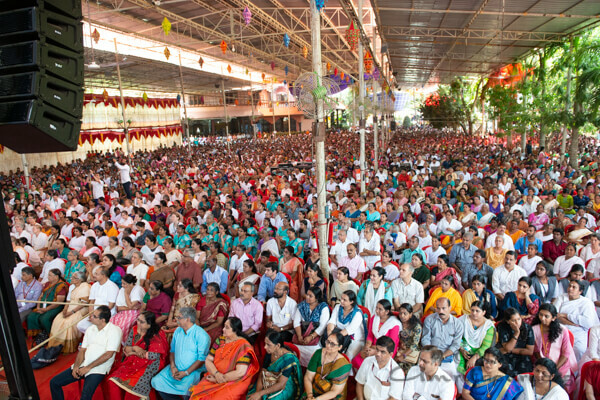 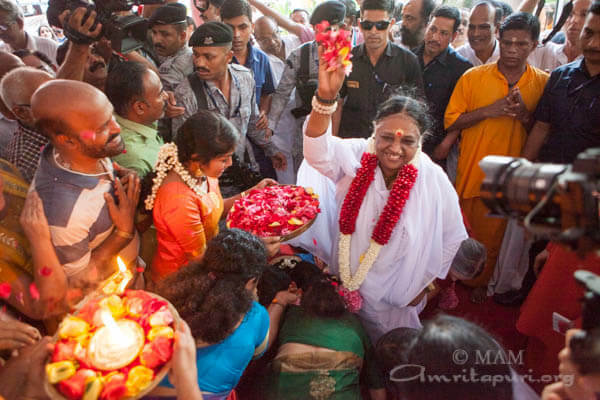 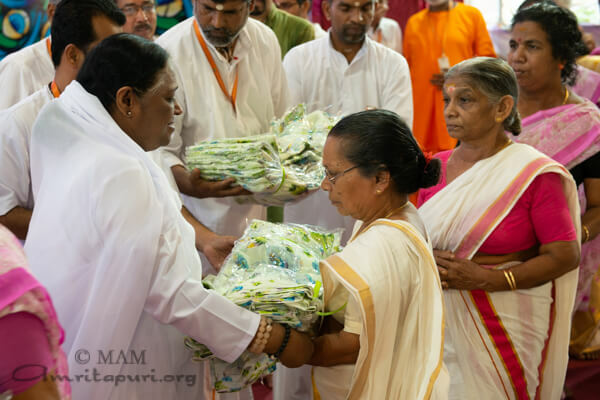 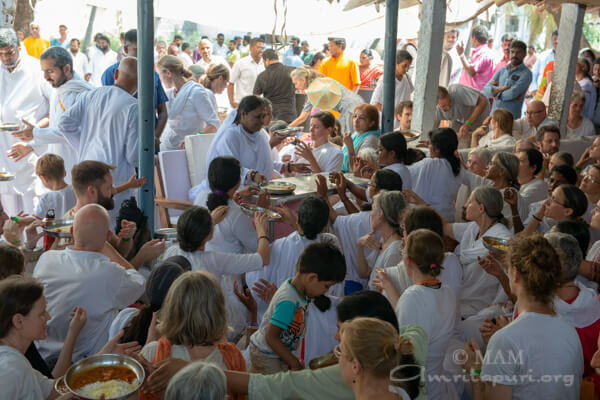 Amma called upon devotees to utilise their worldly existence to make the world an even more beautiful place. 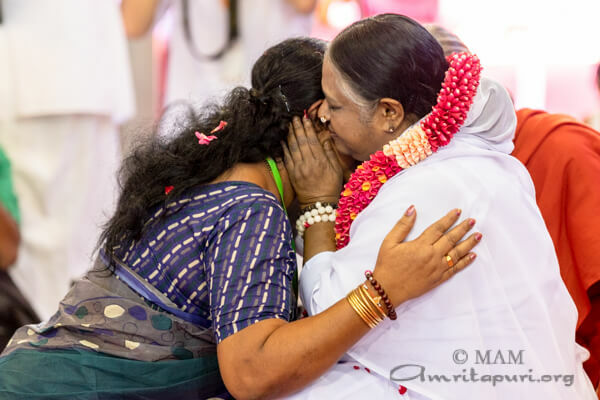 What really matters, Amma said, is how much one has been able to positively influence others through one’s thoughts, words and actions. 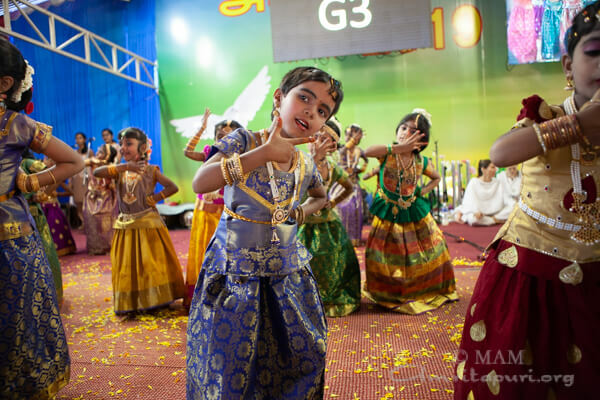 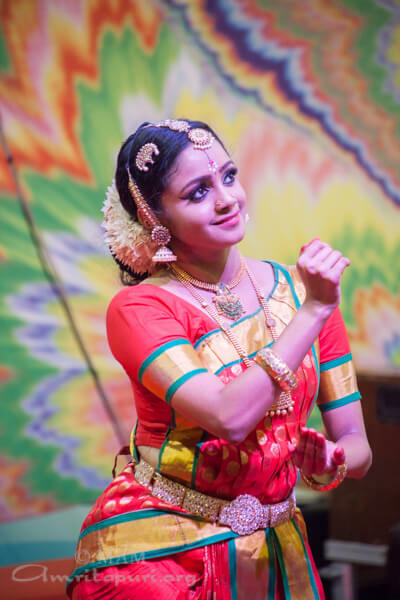 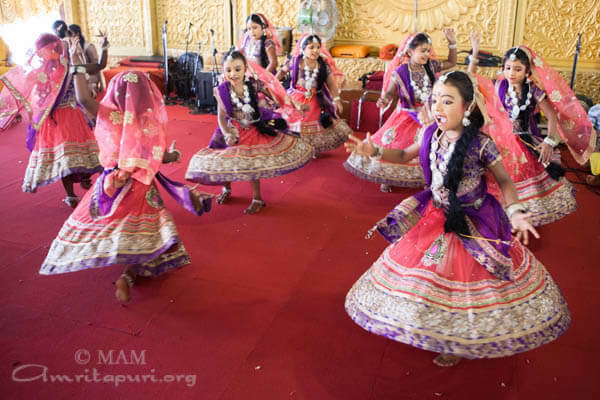 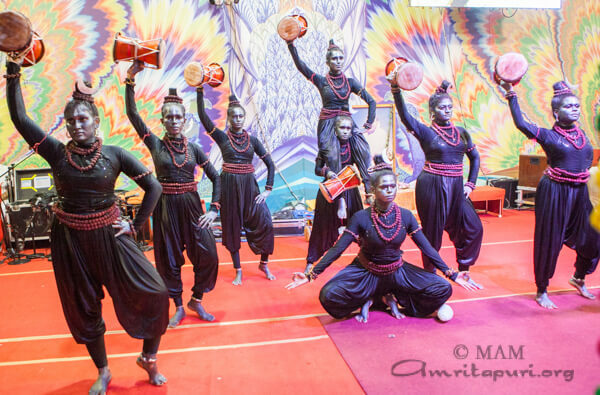 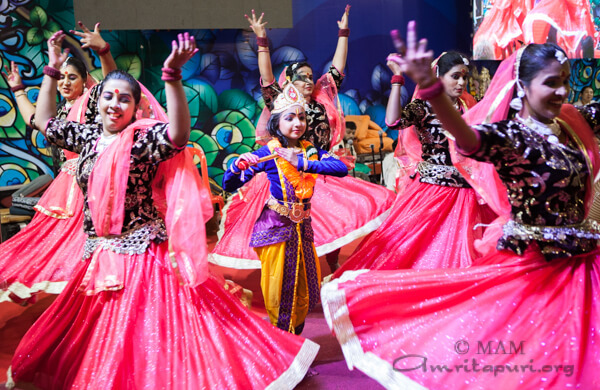 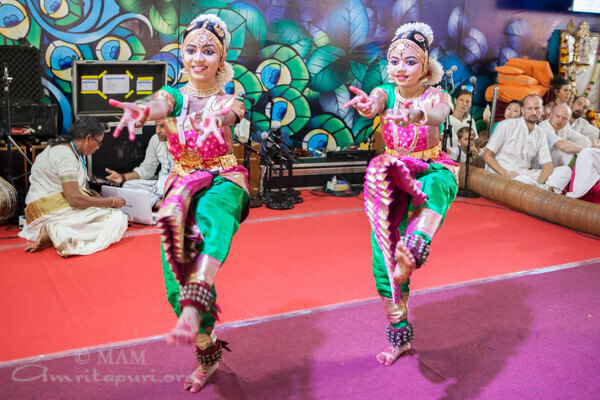 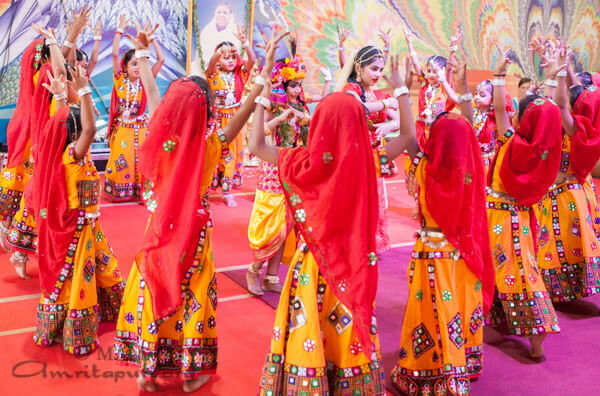 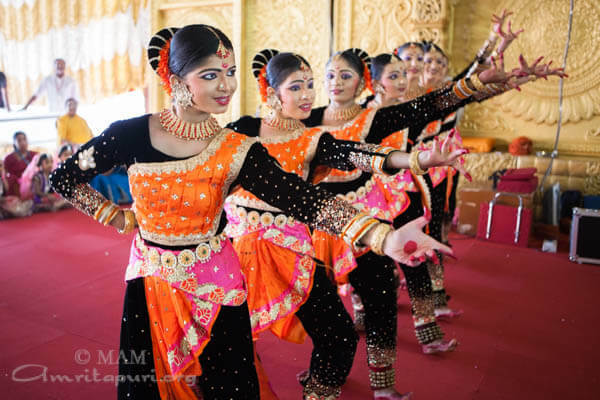 Throughout the programmes, students of Amrita Vidyalayam and Amrita Balakendra staged dances and plays with deep spiritual and cultural meaning. 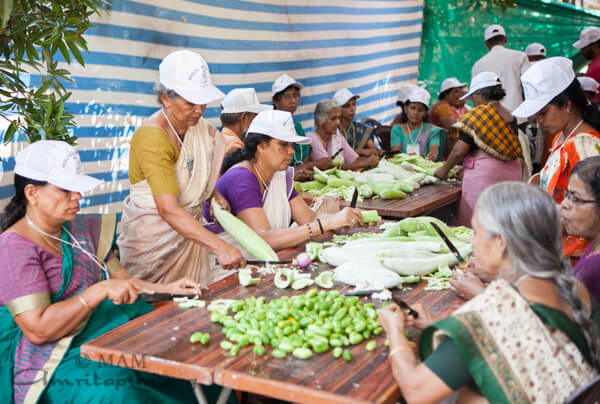 * A total of 17 units in 7 Panchayats of Tiruvananthapuram since its launch last year. The lists of Panchayats – Vilappil (8 units), Kilimanoor (4 units), and one unit each at Perinkadavila, Balaramapuram, Karinkulam, Chirayinkizh and Kizhuvillam Panchayats.